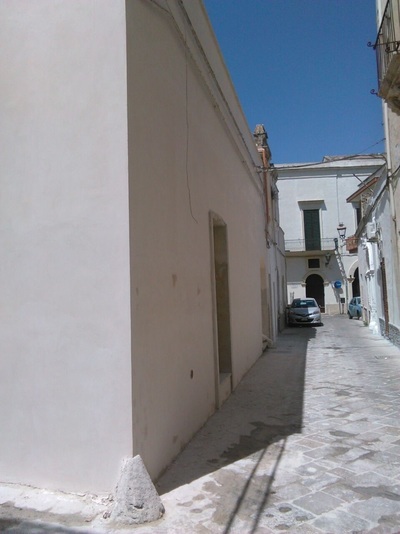 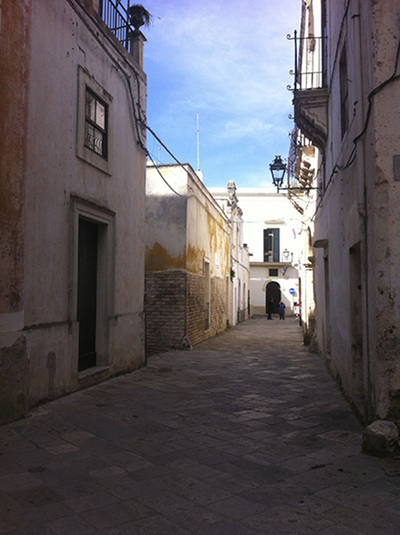 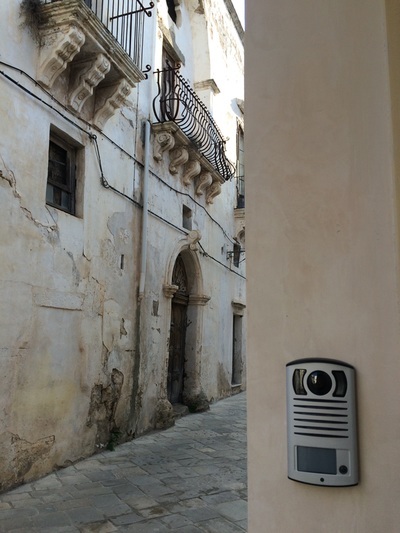 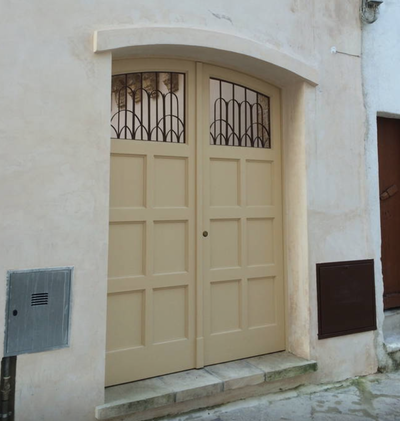 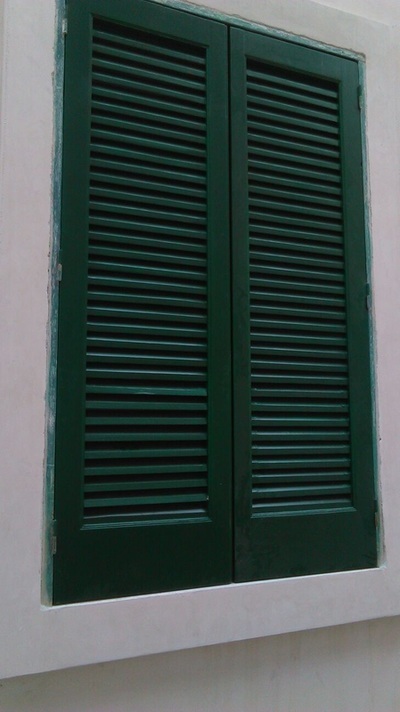 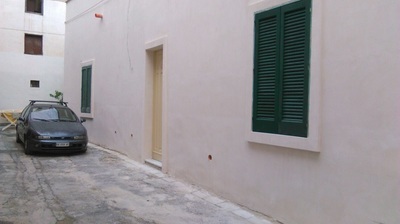 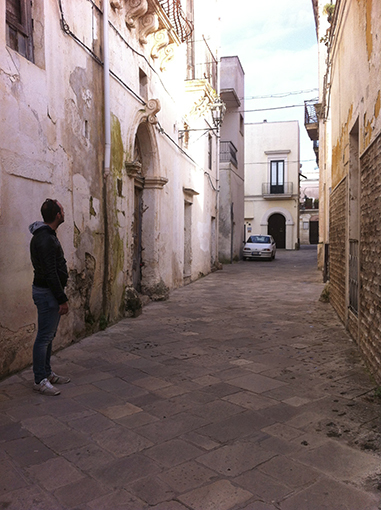 My choice was to make a new home in the historic center of a town. I wanted neighbors, convenience, security and freedom from worrying about care taking a rural property. 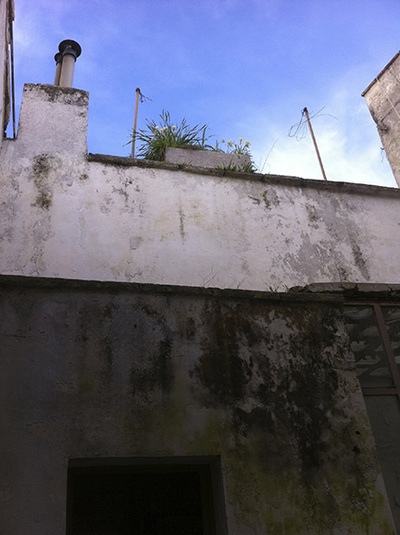 I wanted to be close to the sea and some sandy beaches. 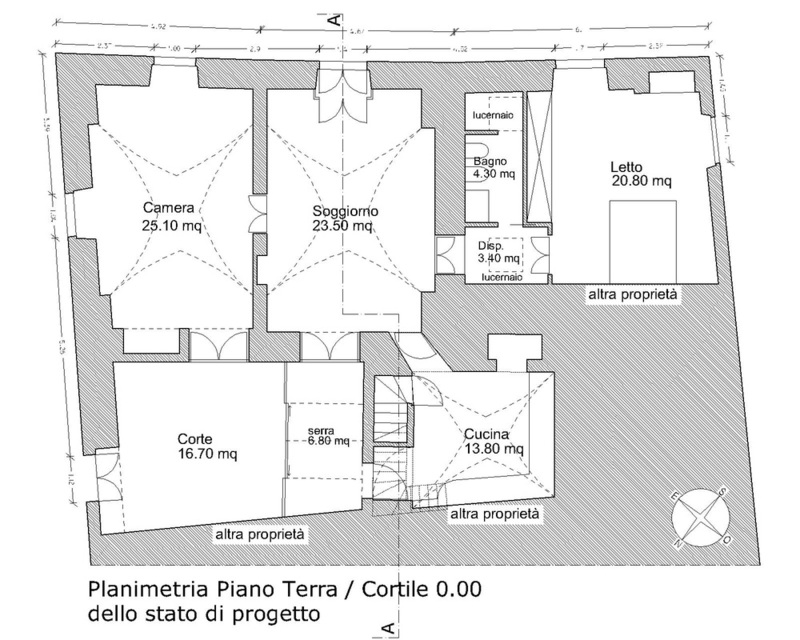 I wanted someplace flat for my older years, a ground floor house. 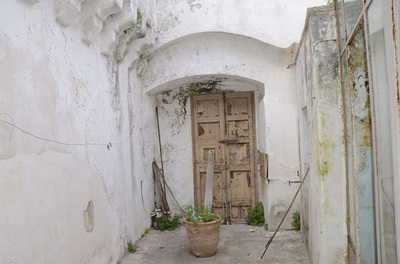 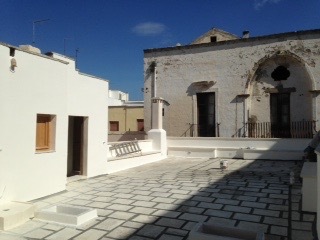 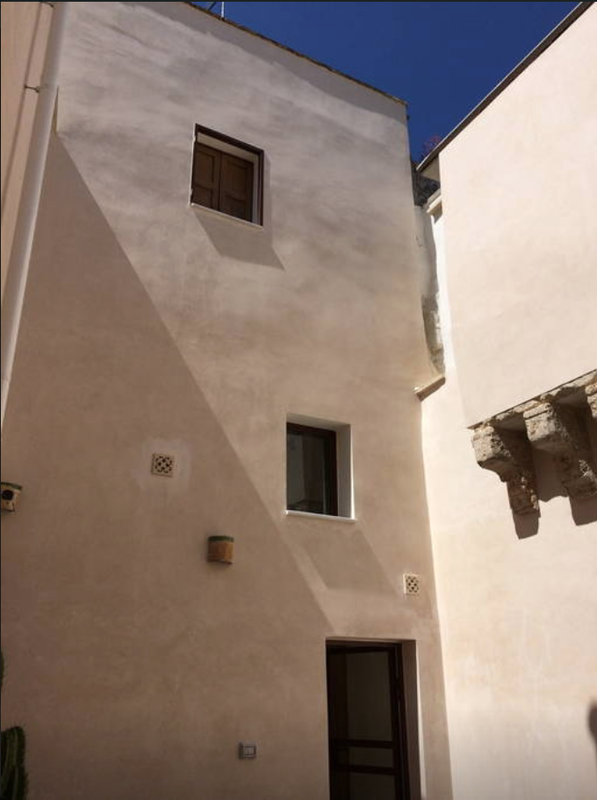 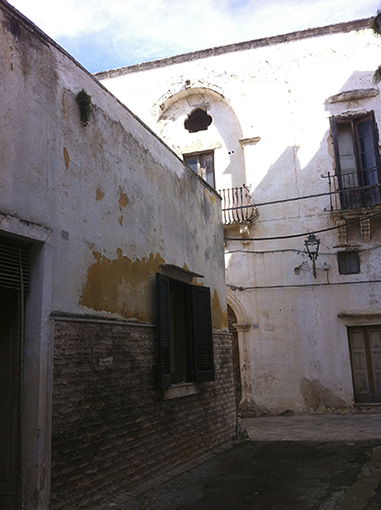 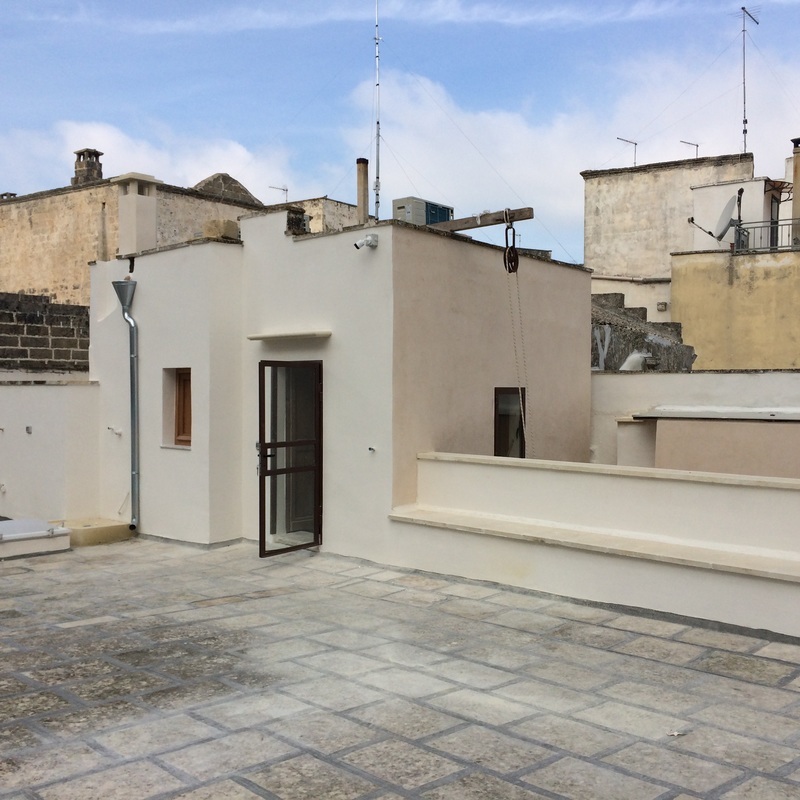 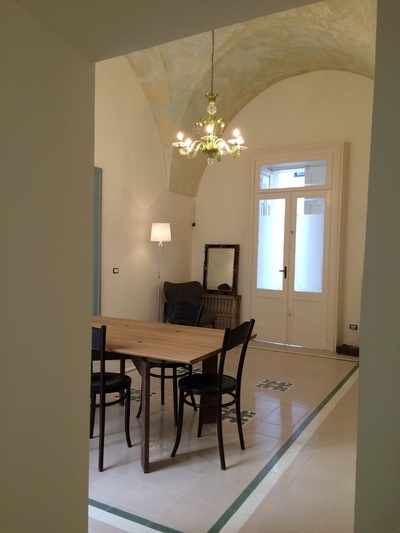 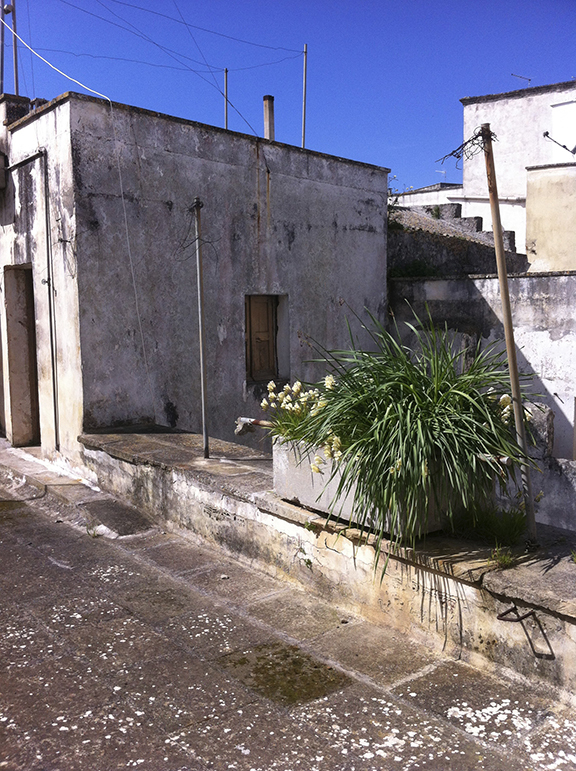 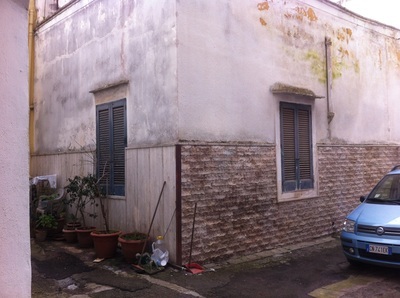 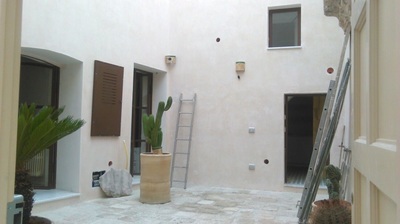 A private courtyard, a nice terrace, enough space for 2 guests and a small studio. 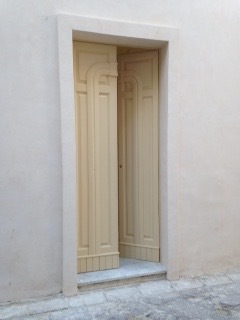 I found my house in Nardó. 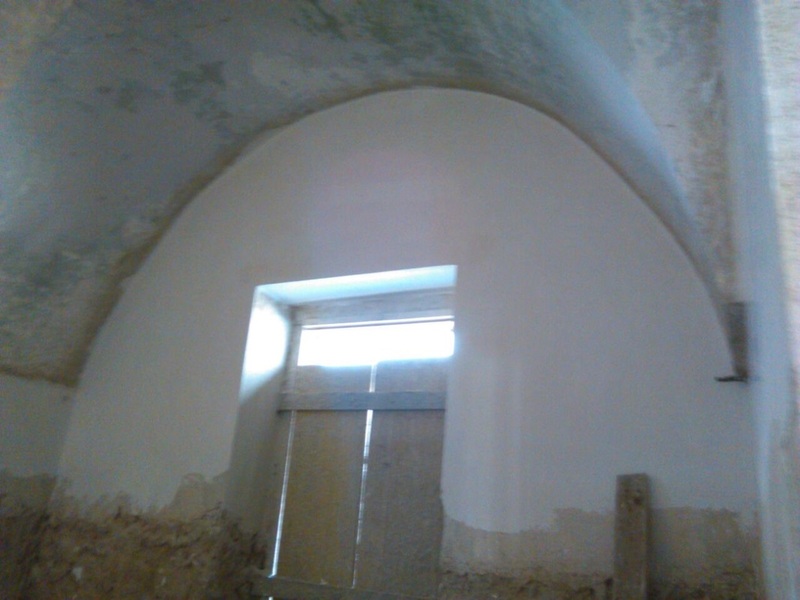 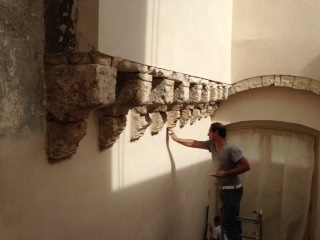 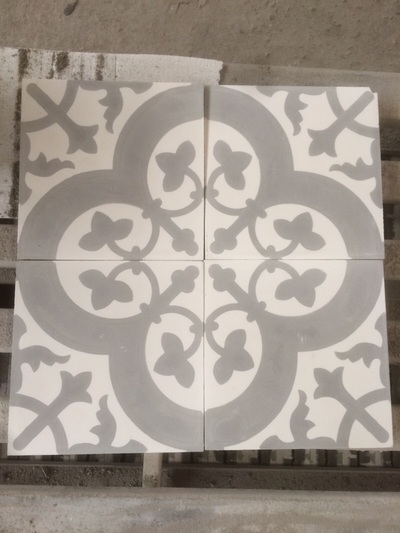 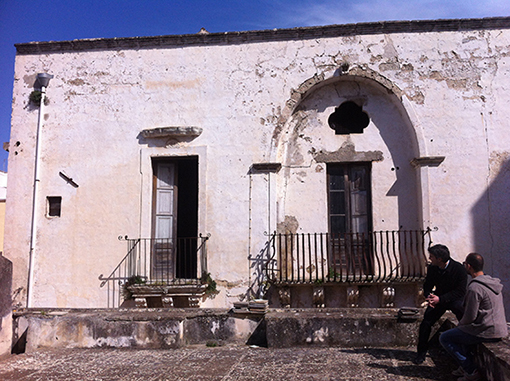 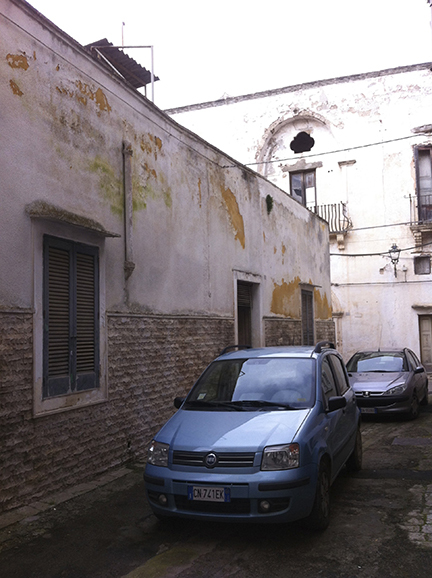 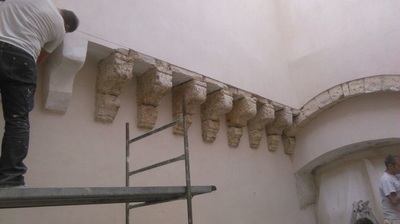 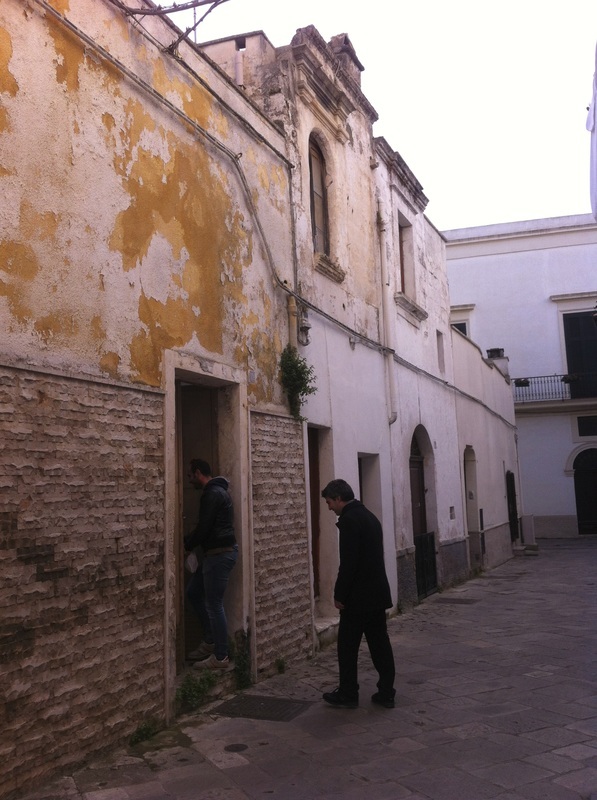 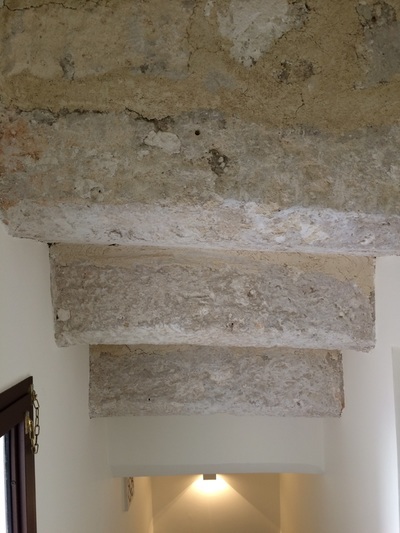 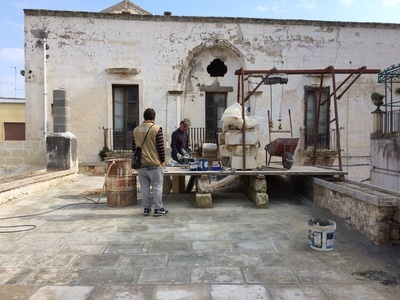 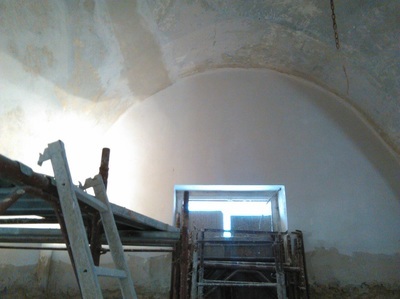 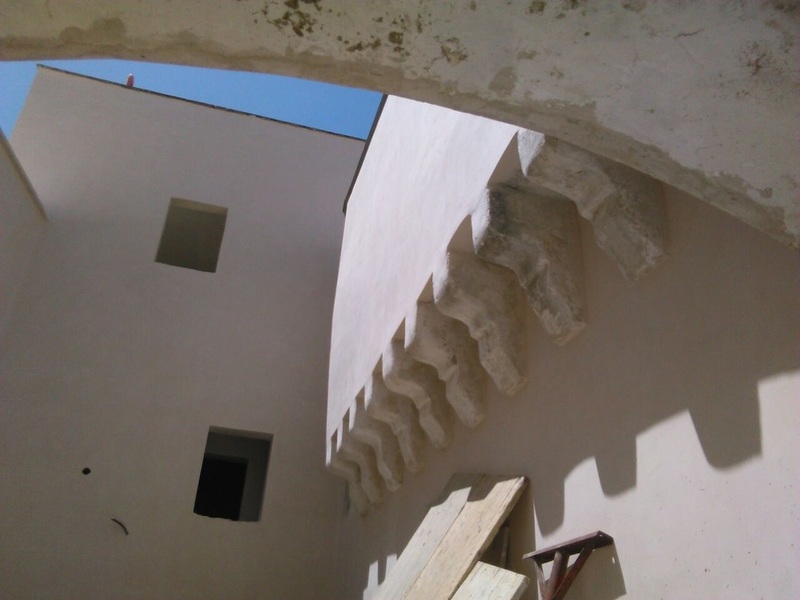 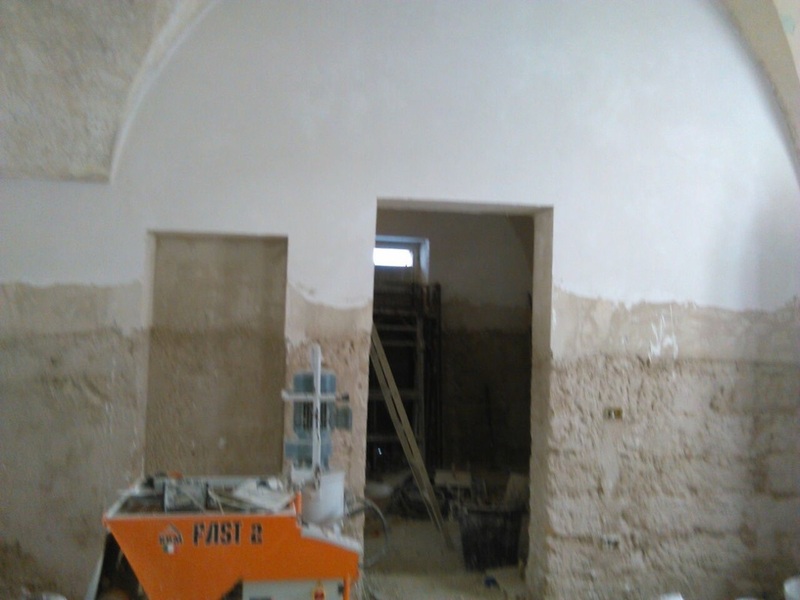 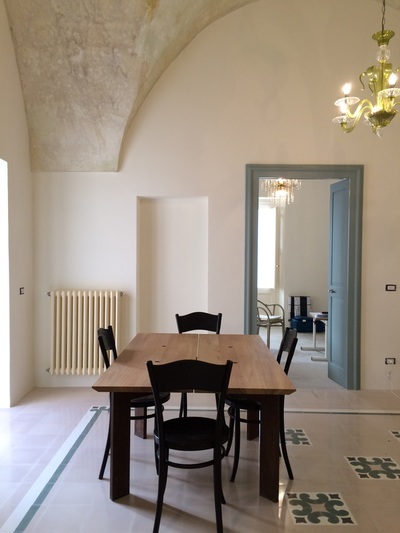 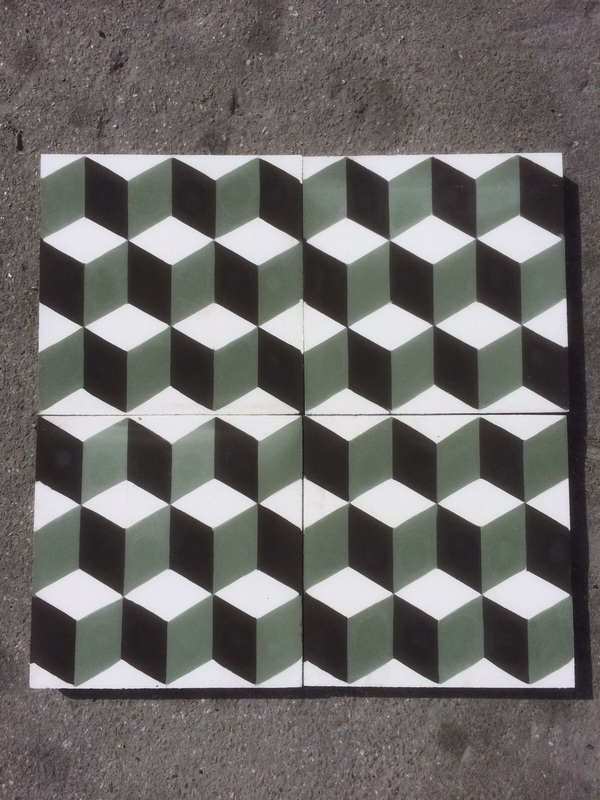 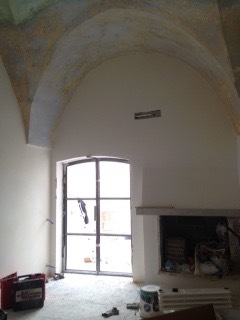 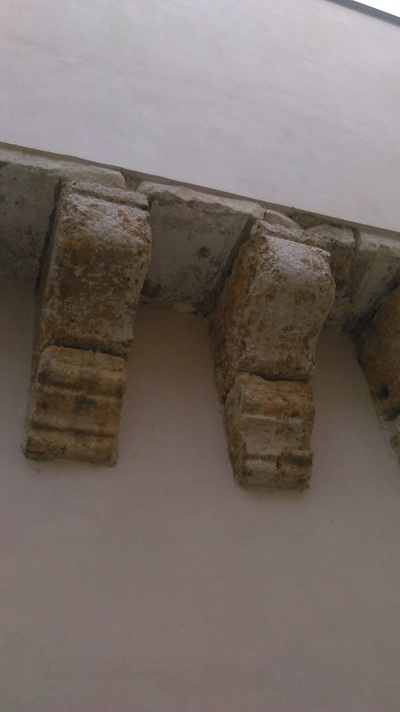 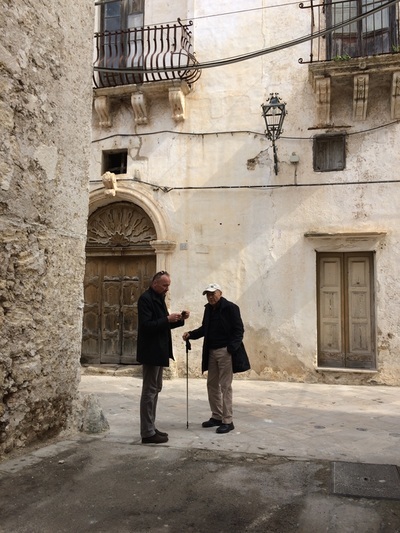 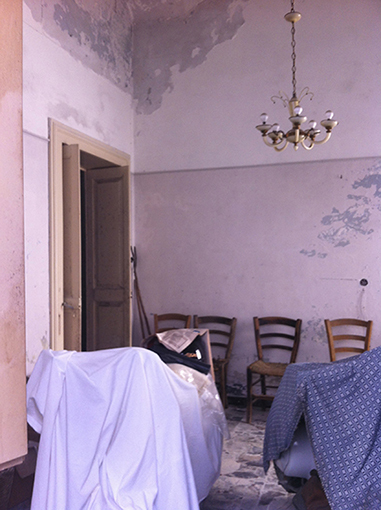 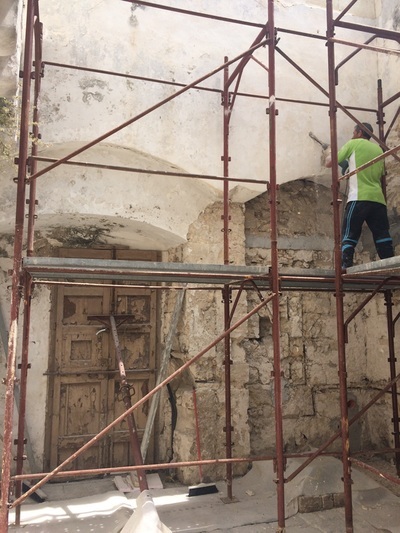 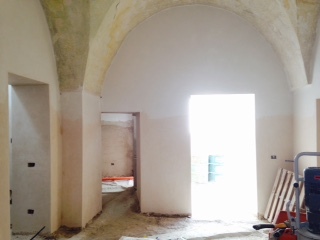 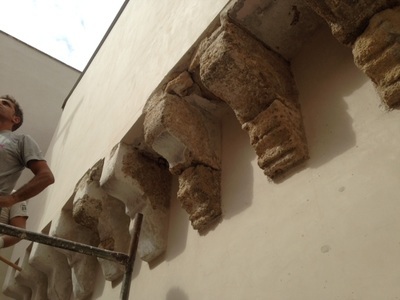 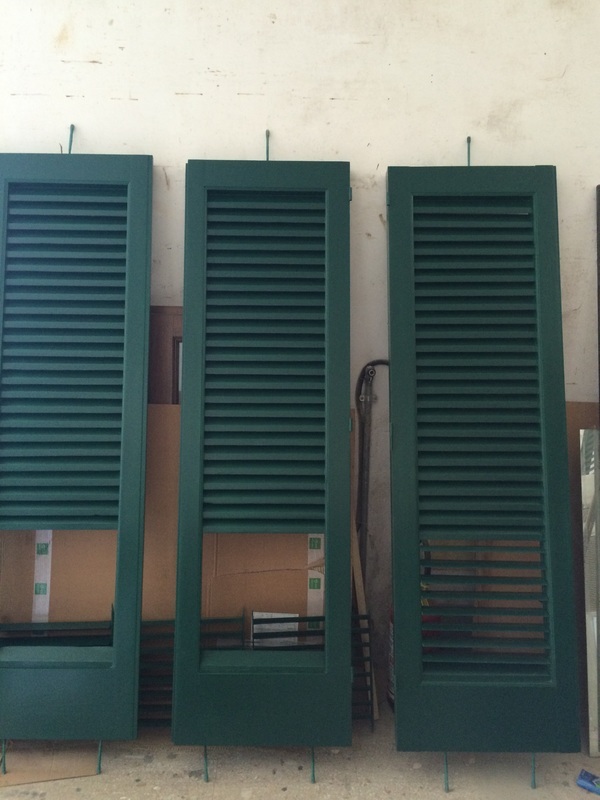 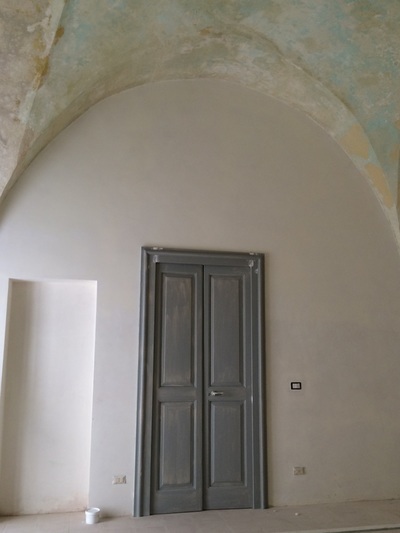 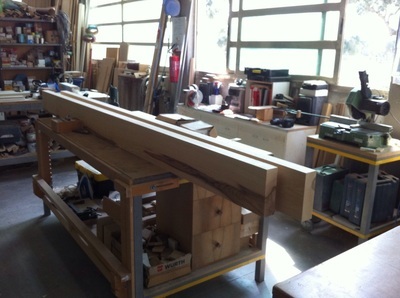 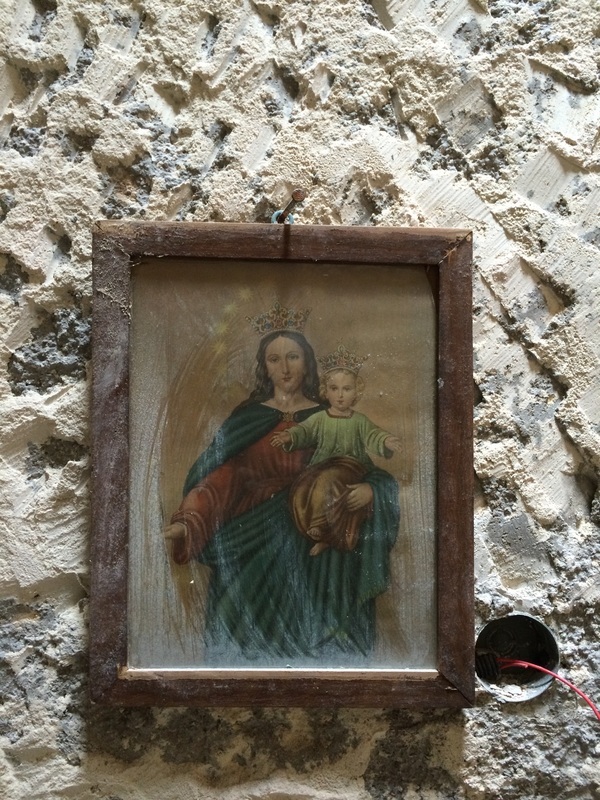 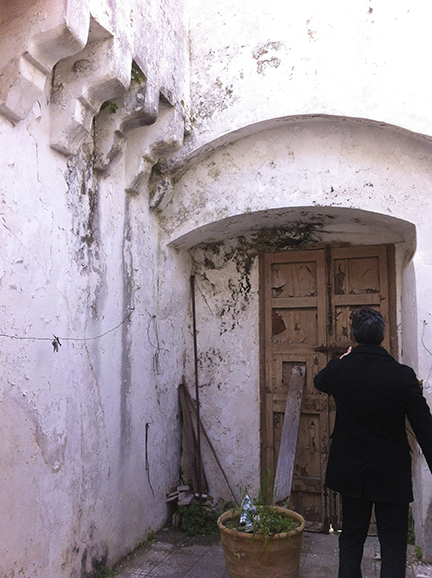 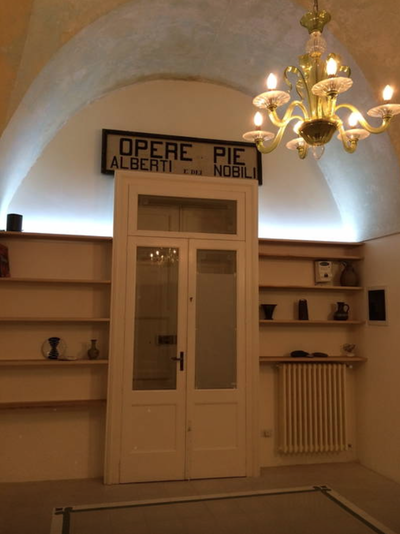 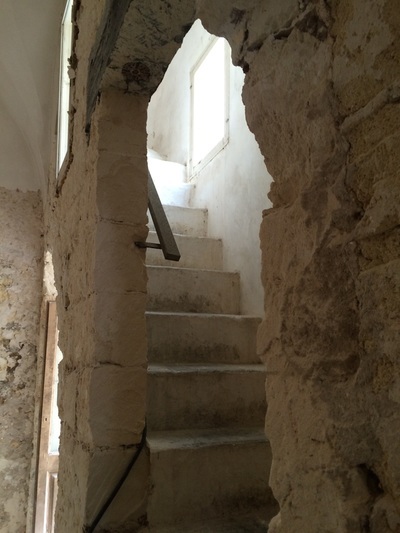 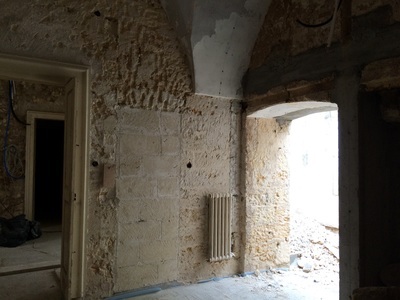 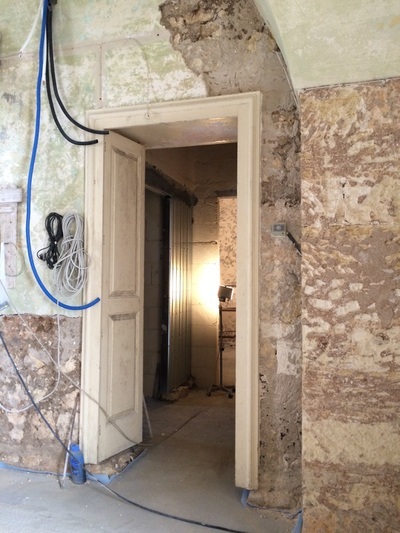 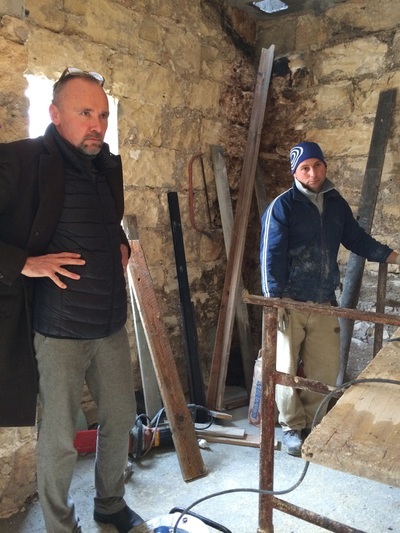 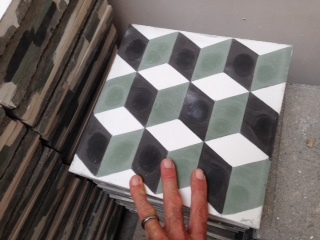 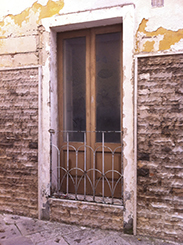 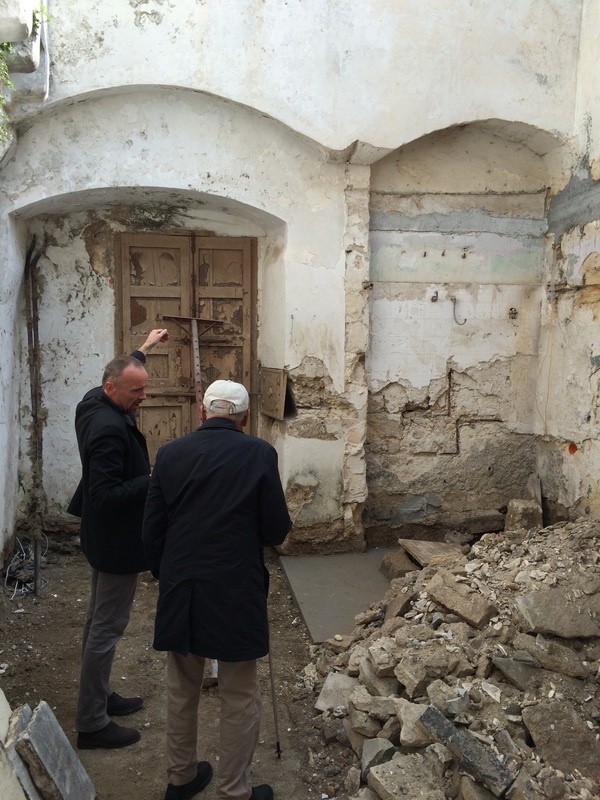 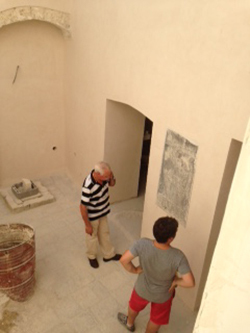 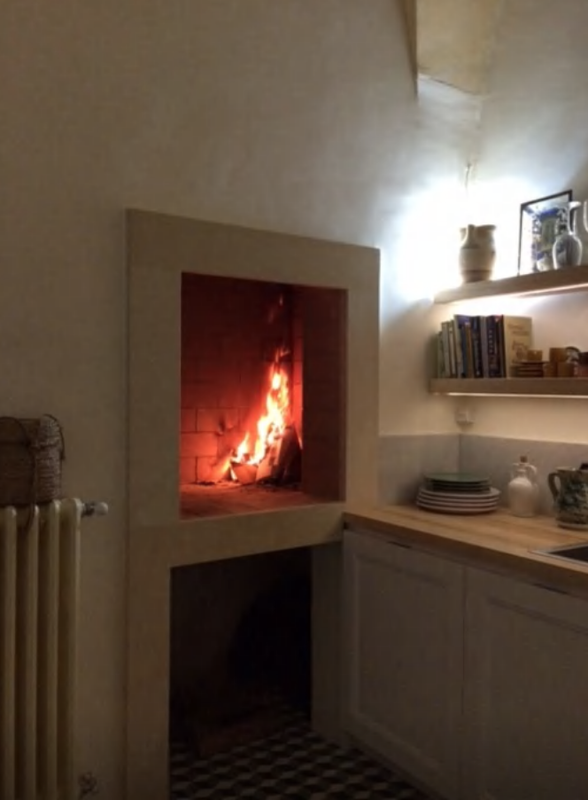 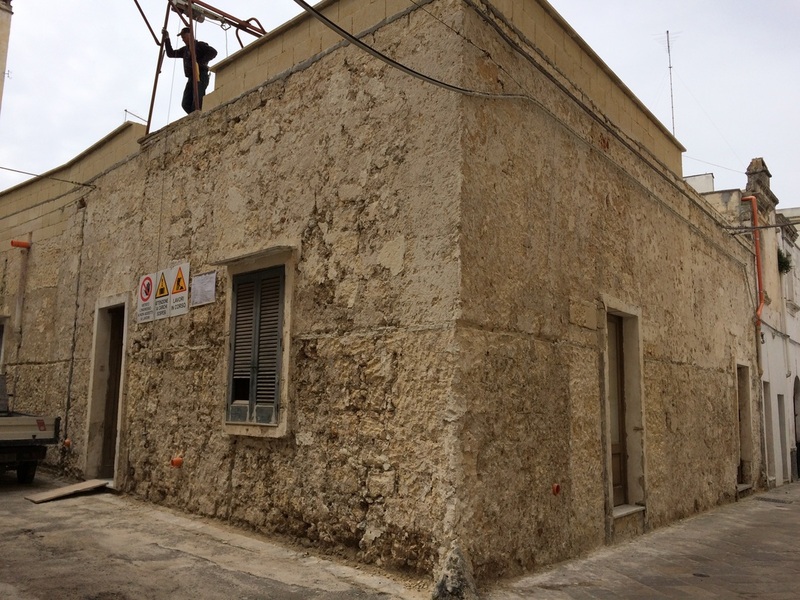 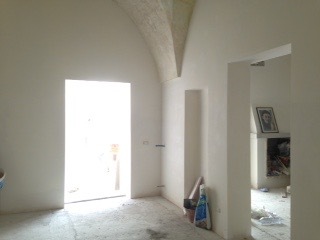 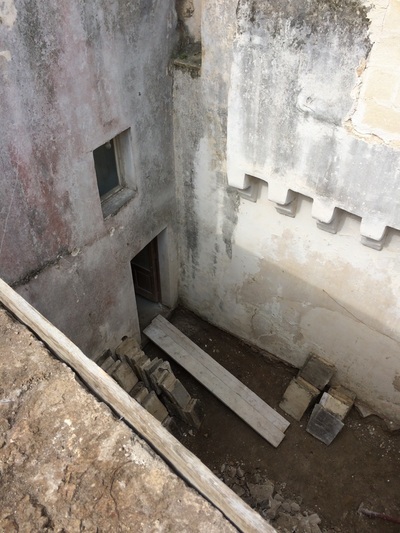 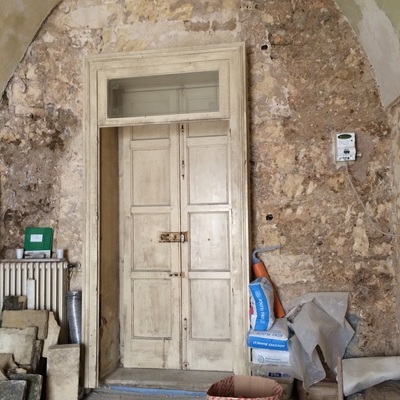 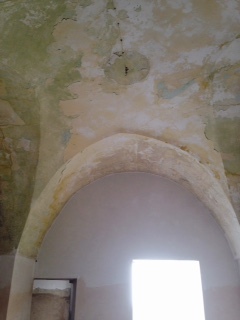 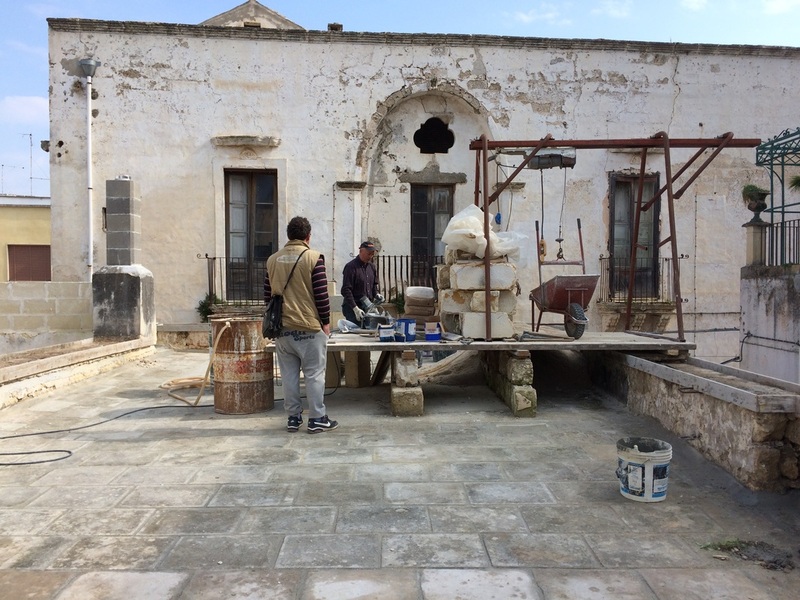 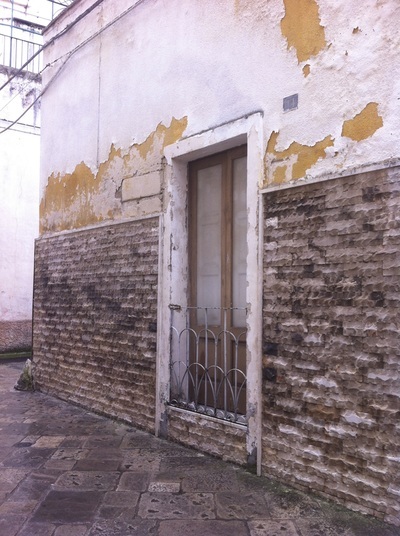 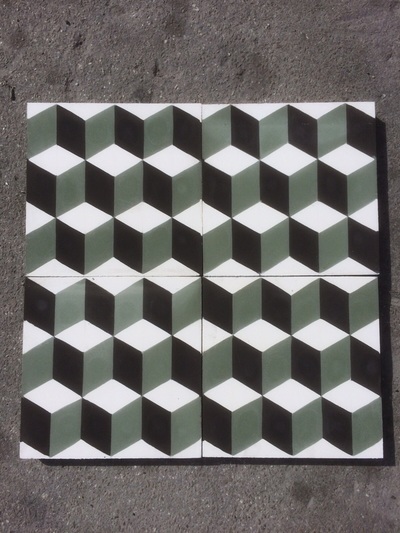 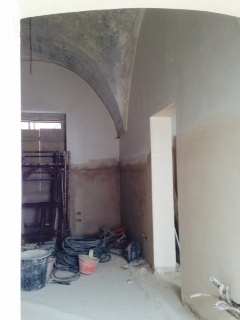 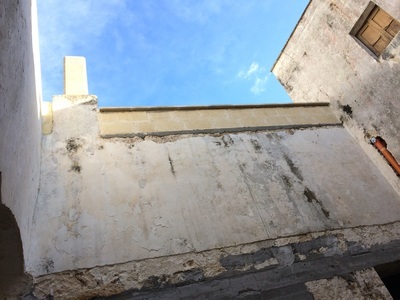 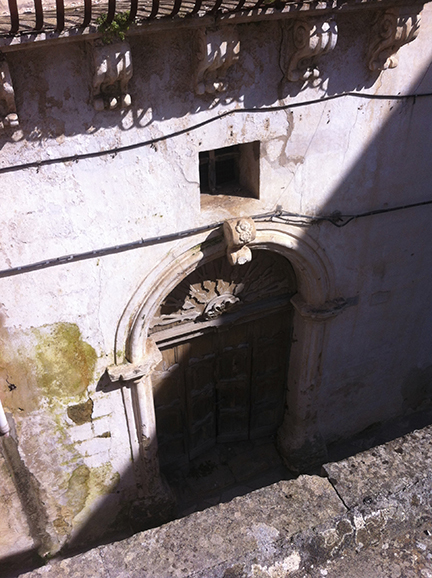 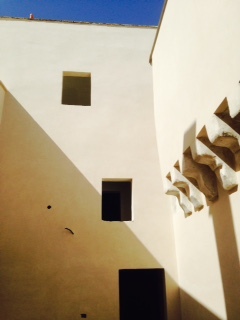 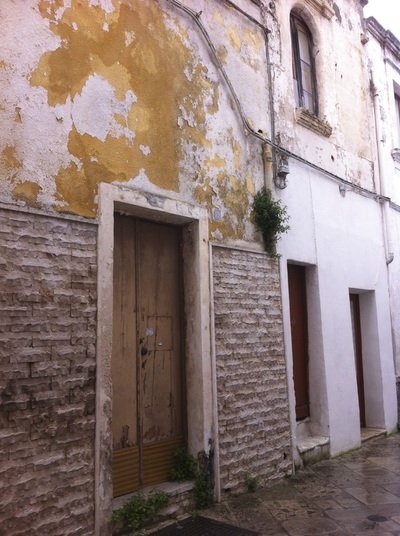 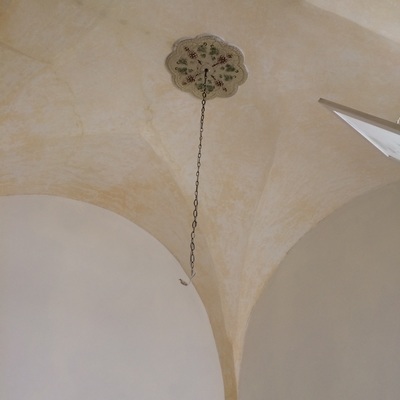 My restoration project is guided by a team: my friend from Umbria, Architect Martin Stubenrauch, local geometra Salvatore and contractor Roberto Bruno. 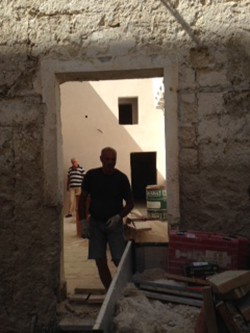 While Martin speaks English the rest of the team is "italian only". 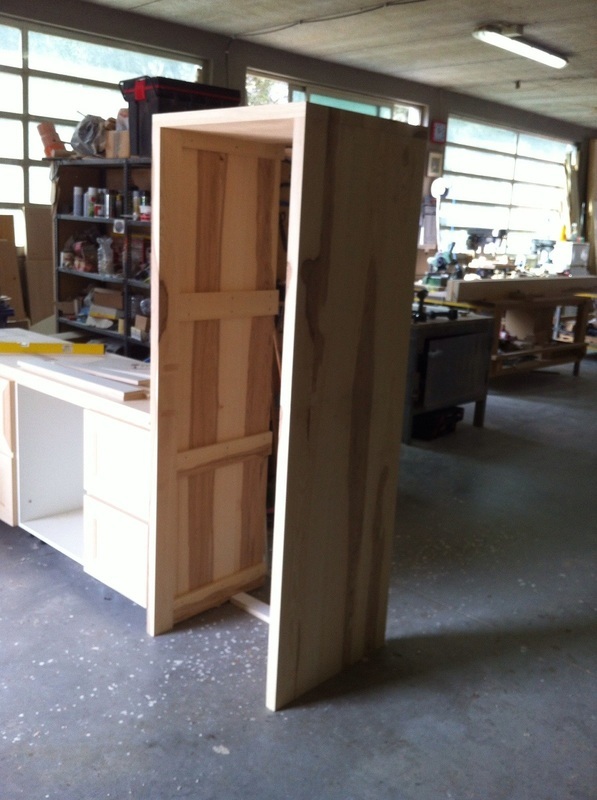 Below is a gallery of the process of my project, which was a little bigger than I thought it would be, but isn't that always the case?? We begin with "as we found it" photos. 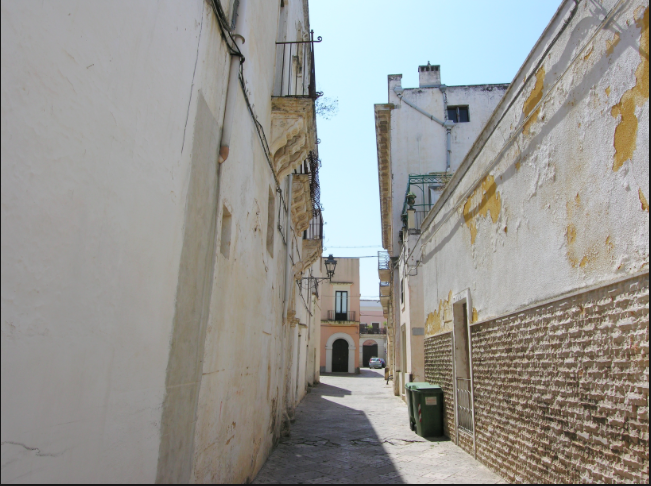 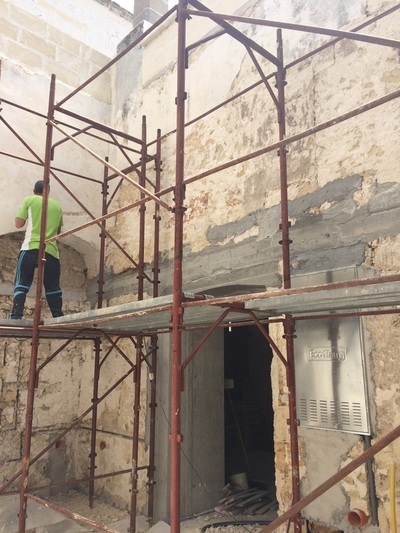 In short, Nardó is an ancient place of water, which means the houses are humid so our biggest task was to eliminate humidity by created a new foundation. 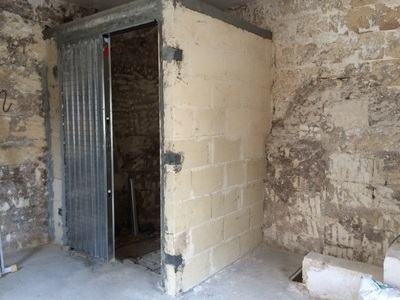 The contractor dug down about 16" and reinforced the support walls with rebar and cement, then added gravel and a ventilation system that exits the outside walls. 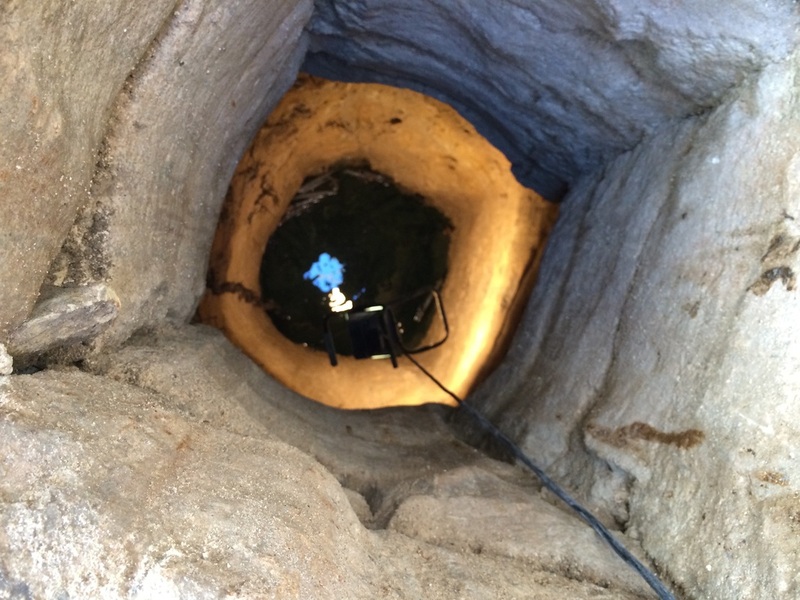 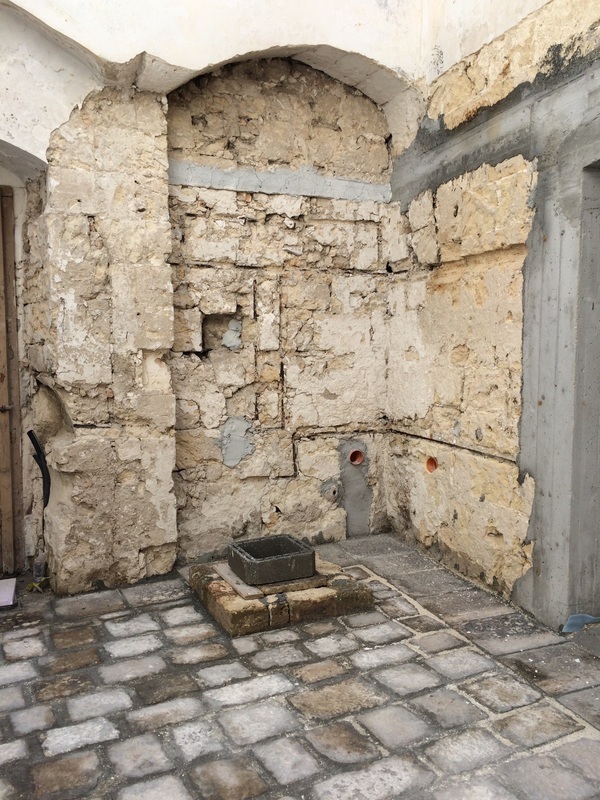 When the crew demolished an illegal addition in the courtyard, an ancient well containing a spring was revealed. 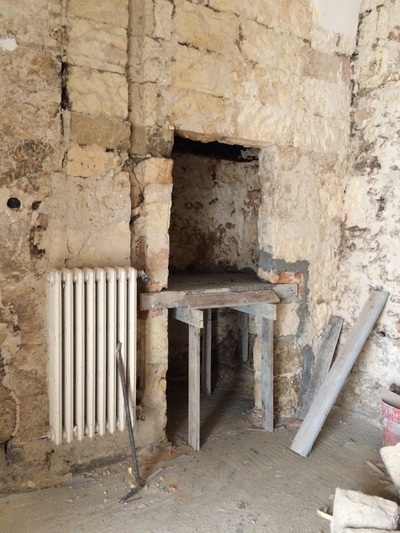 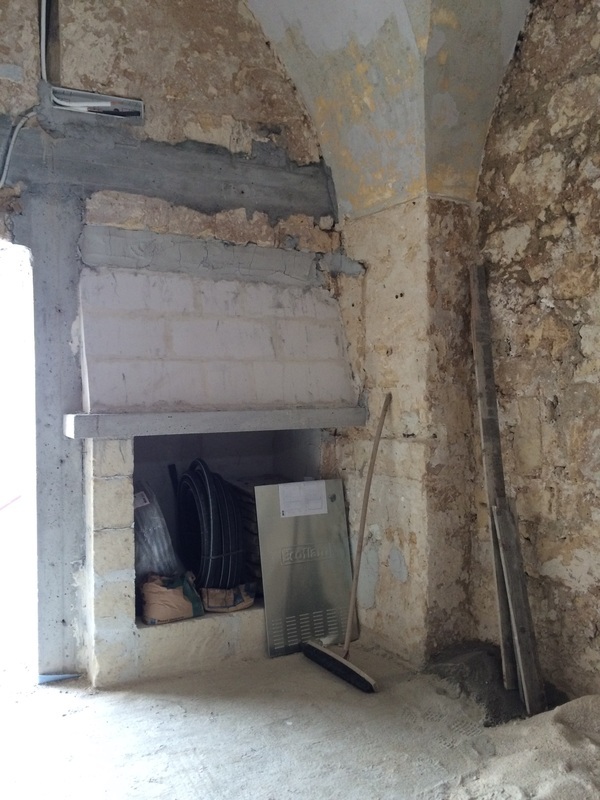 We also uncovered three fireplaces. 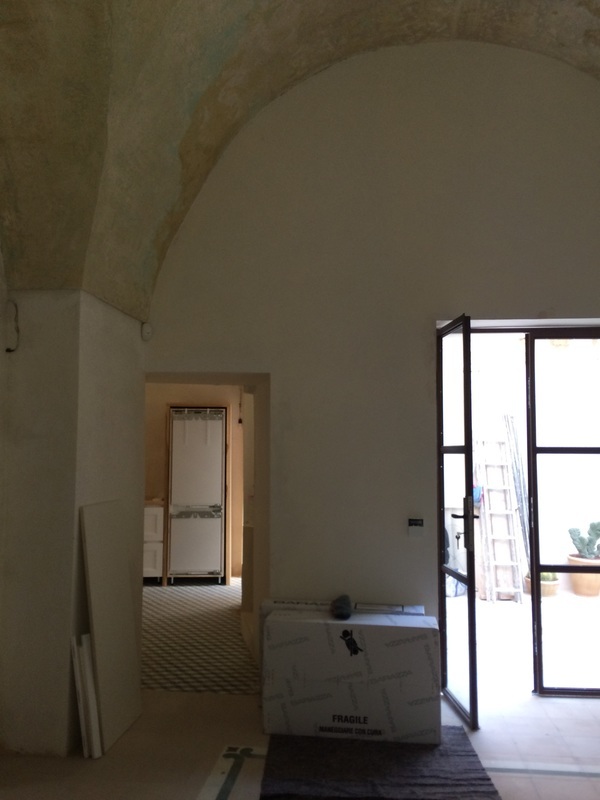 We are integrating two: one into the kitchen and the other in the extra "studio" room. 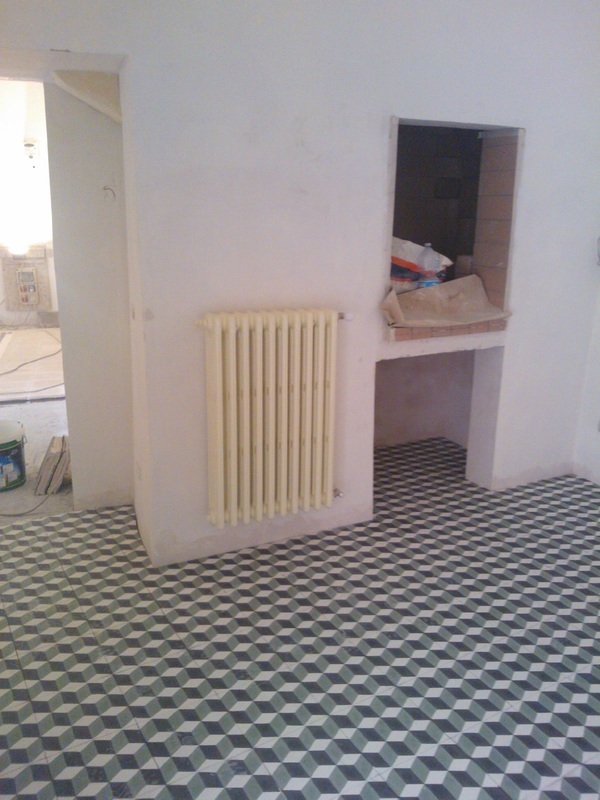 All plumbing, heating, and electrical was replaced but we kept all the cast iron radiators. 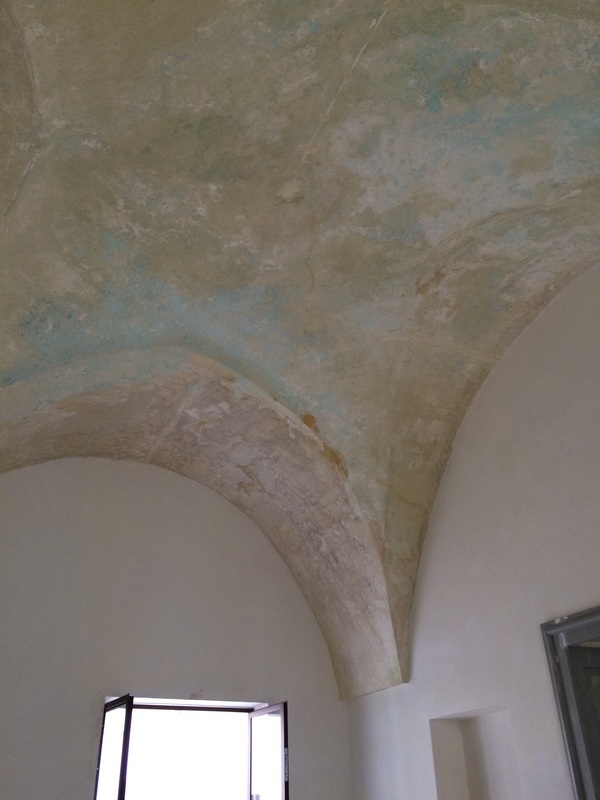 There are 3 rooms with the typical star vault ceilings, all in good shape and we are keeping the original old color there, just stabilizing it, but all the wall plaster had to be removed for the systems to go into the wall and a new high tech plaster coat that prevents humidity will added. This was the single most expensive part of my renovation. 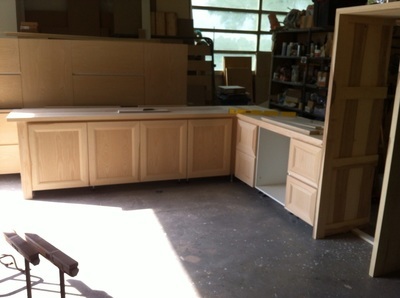 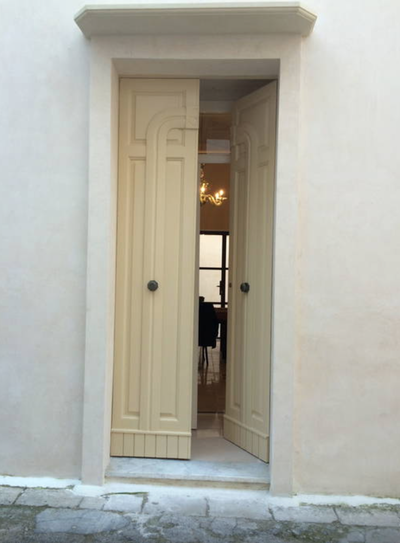 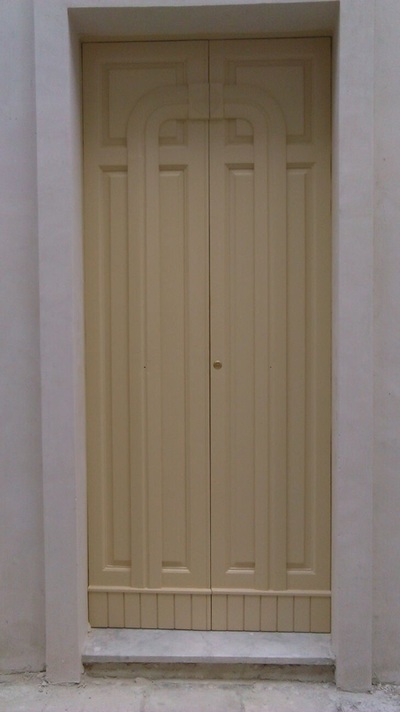 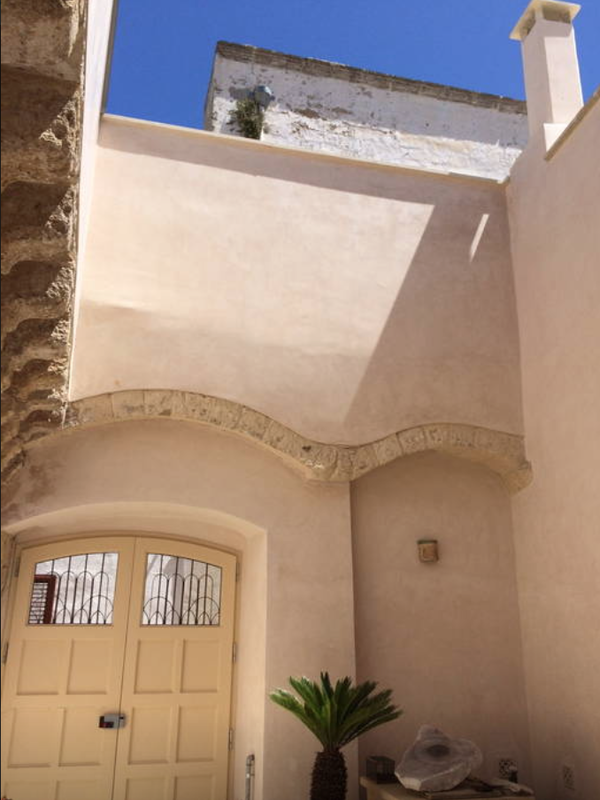 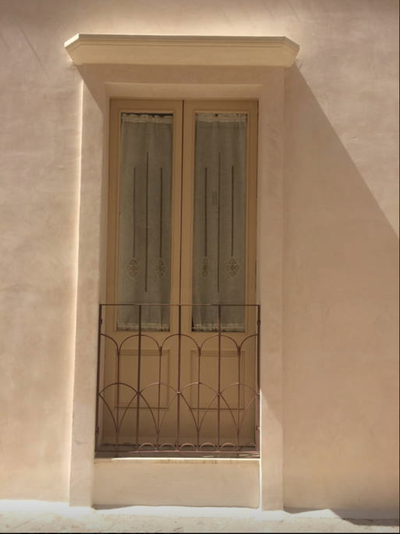 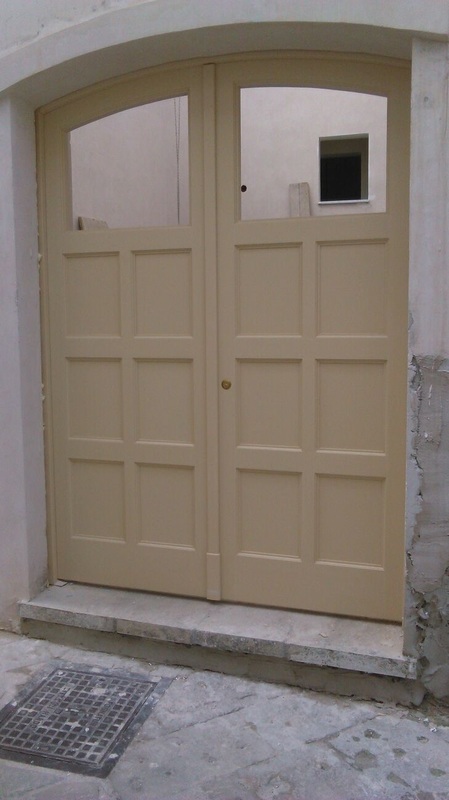 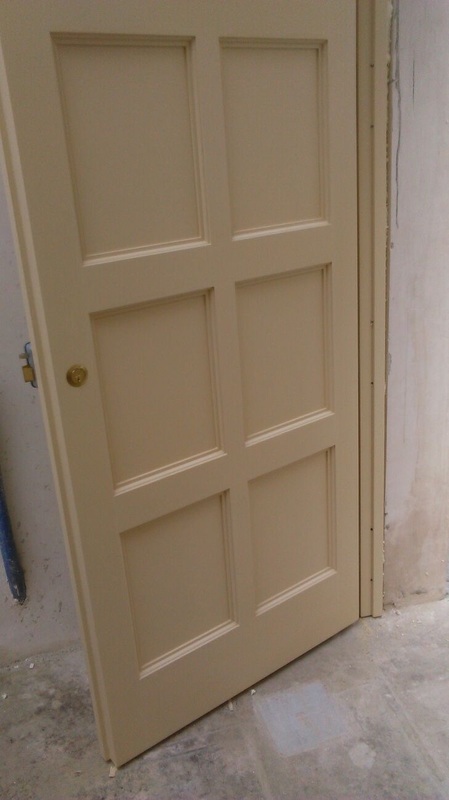 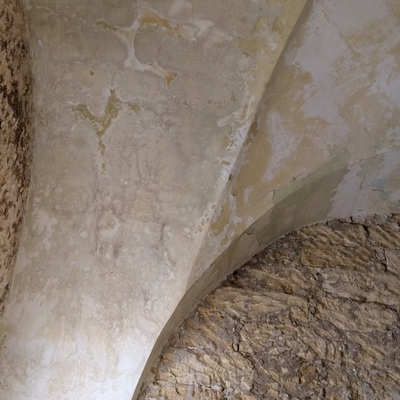 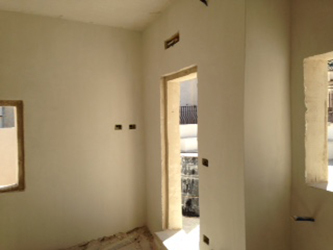 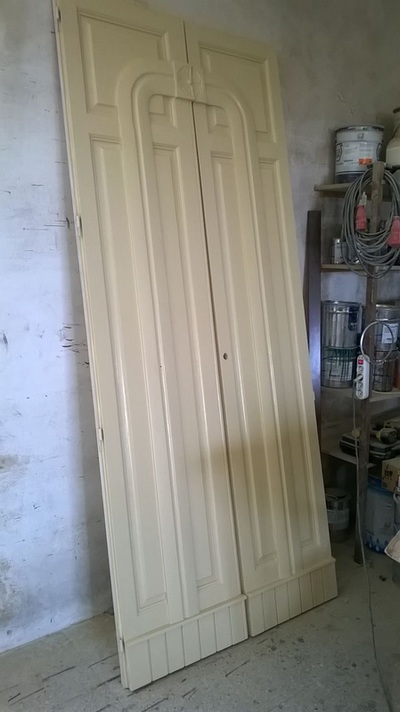 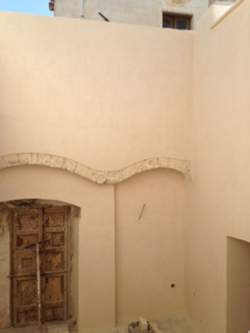 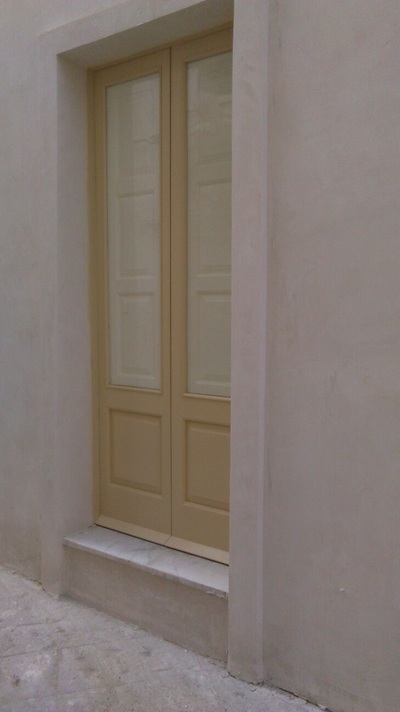 Our plaster coat, inside and out, will stay "natural" unpainted and smooth. 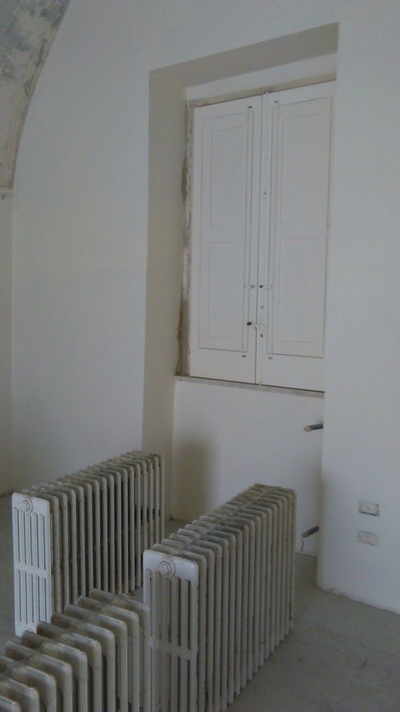 It's a nice soft warm white. 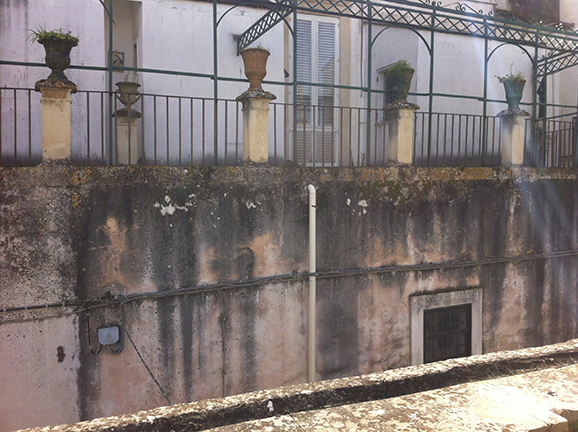 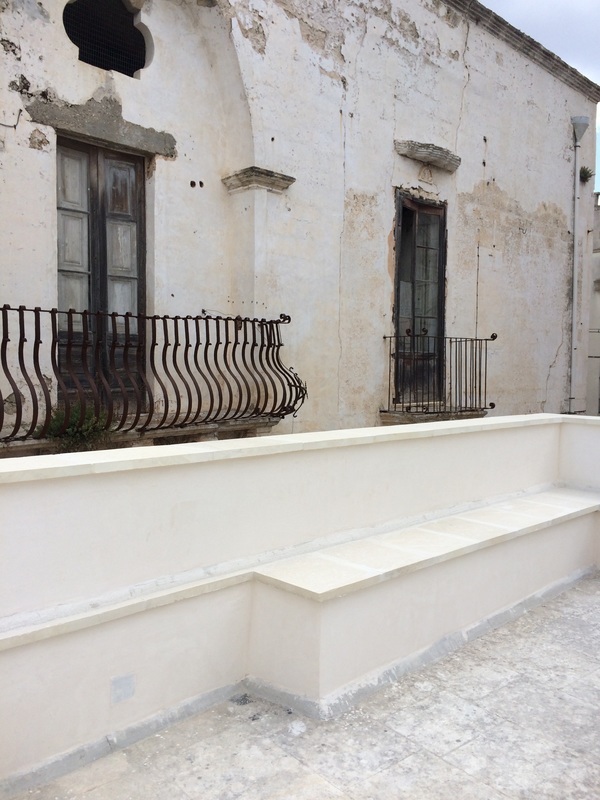 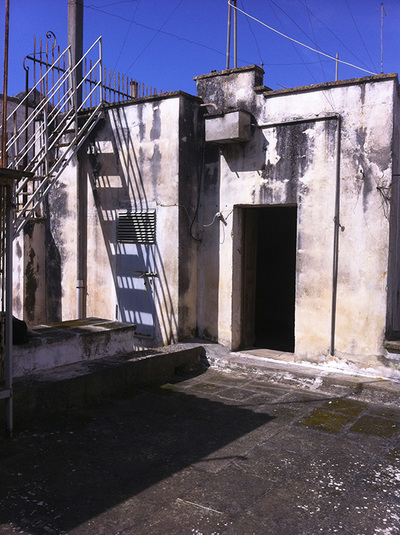 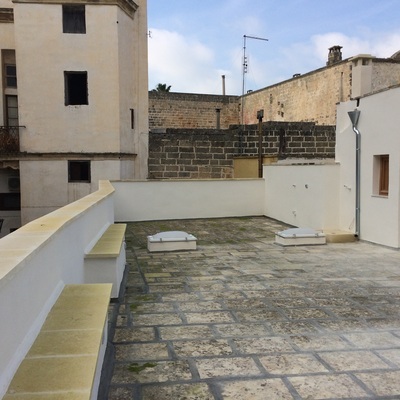 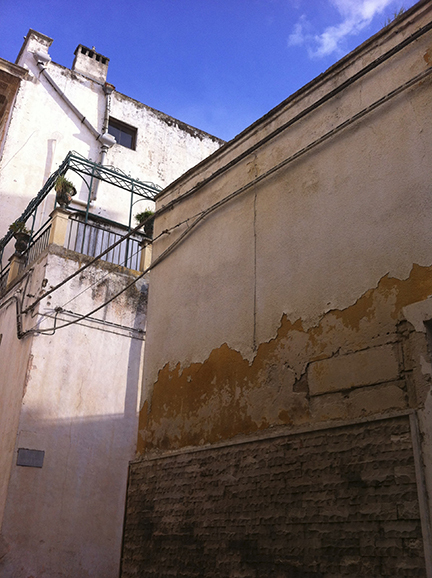 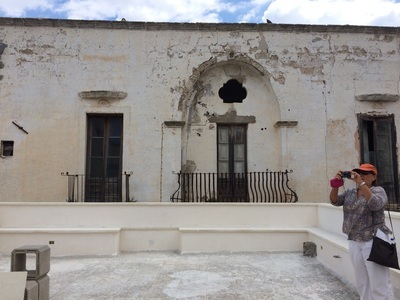 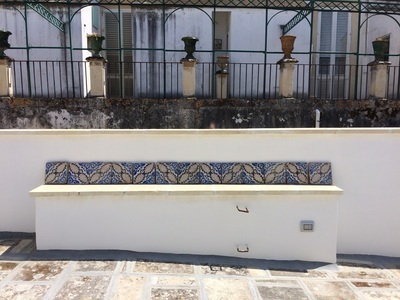 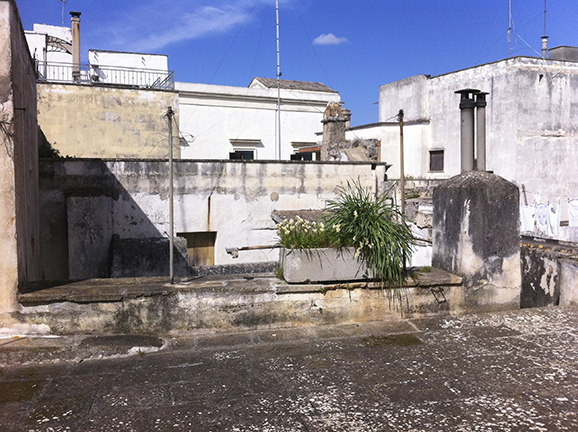 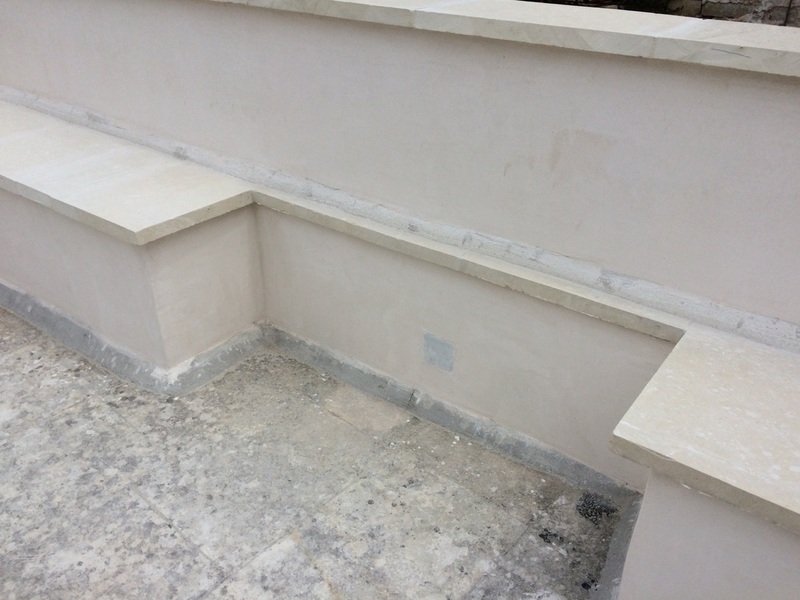 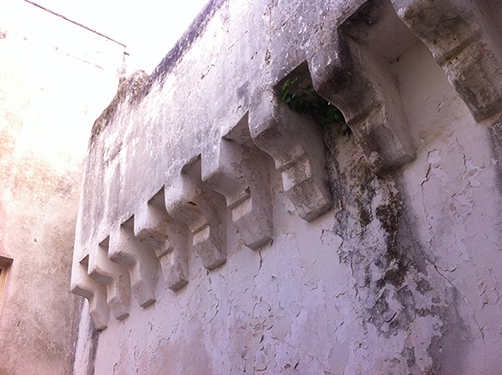 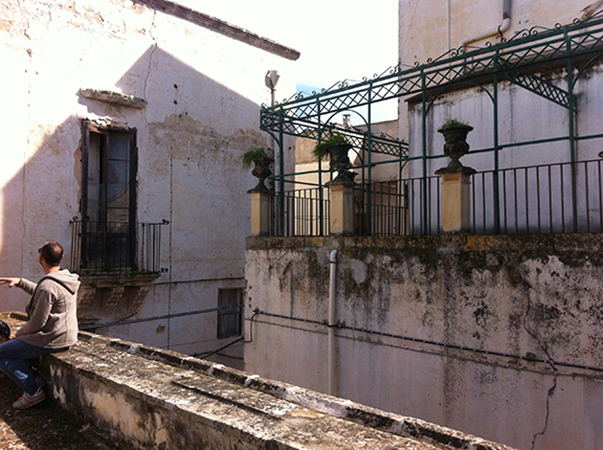 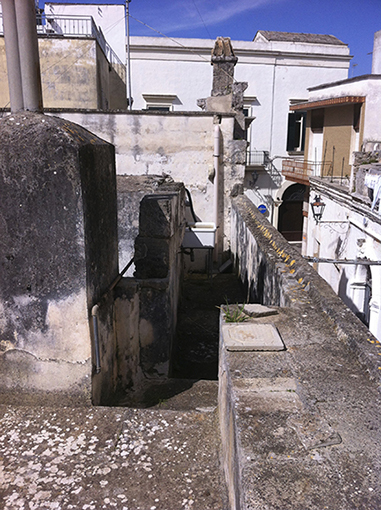 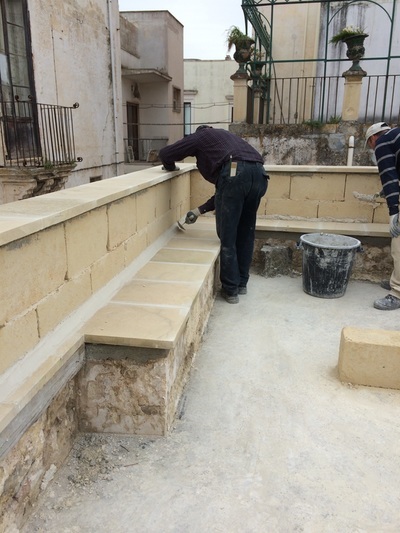 On the large flat terrace, we brought up the height of the parapets for safety but also for seating. 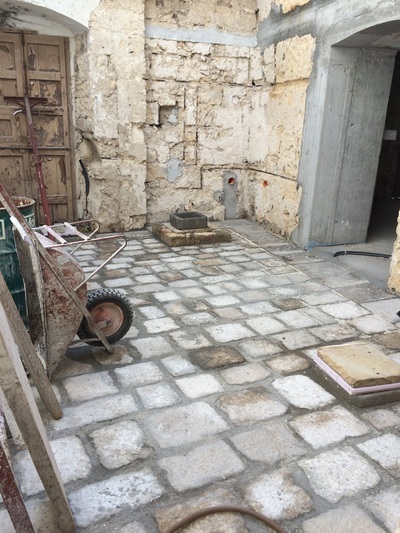 This will become a large entertainment and sun worshipping area with shower, sink, and covered pergola, attached to the adjoining guest room. 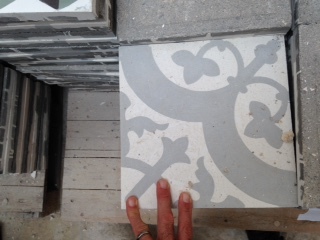 Reaching the 60% mark and happy about that. 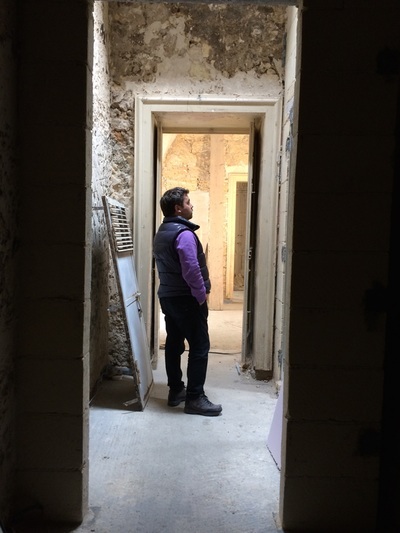 The project has moved along swiftly much faster than I would have imagined and I am still on speaking terms with everyone involved! 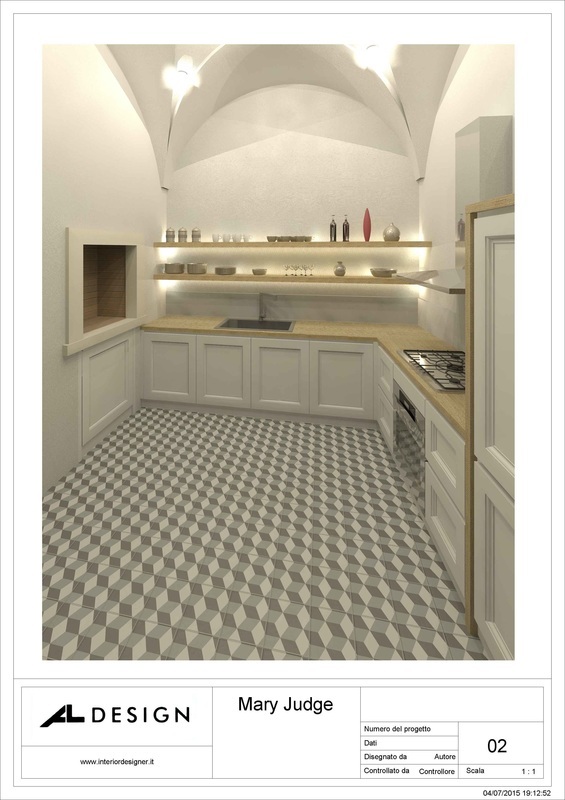 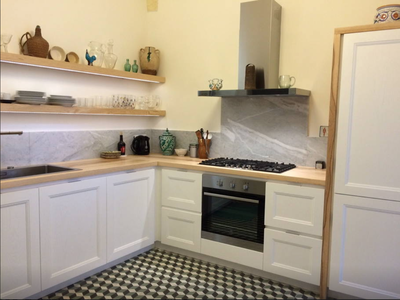 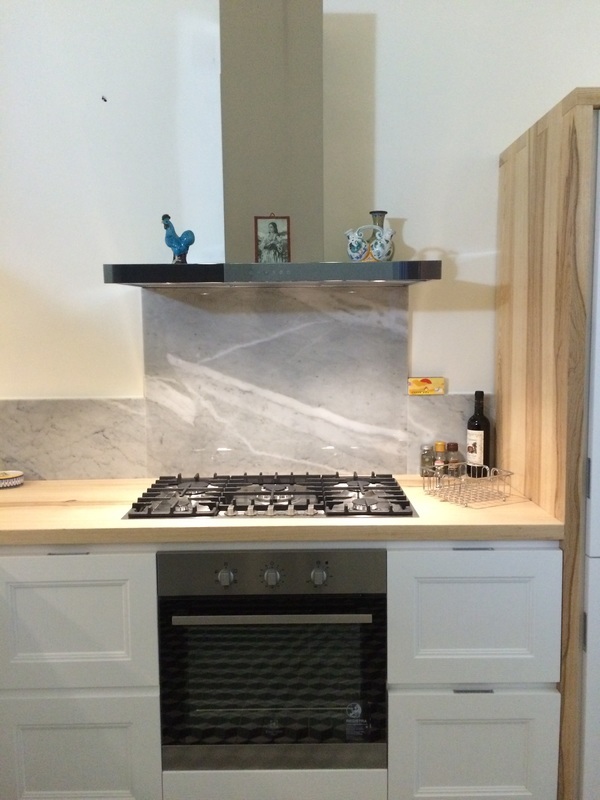 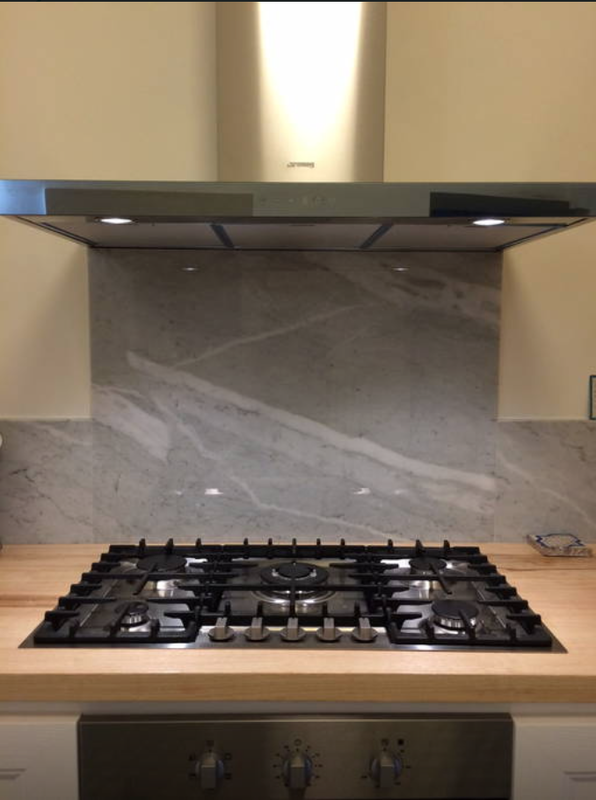 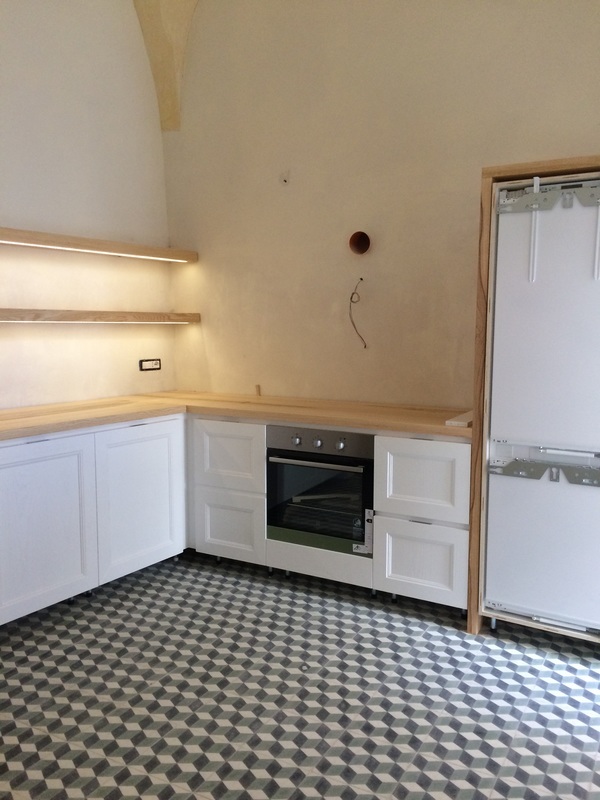 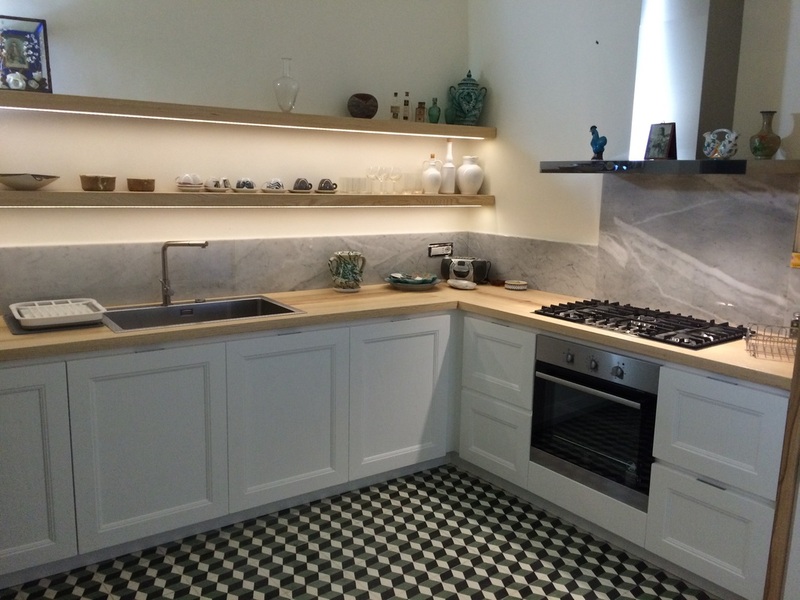 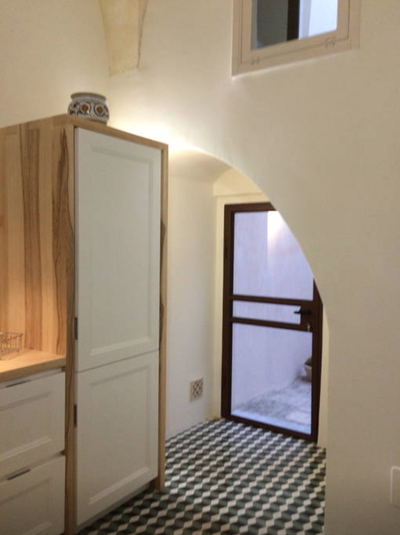 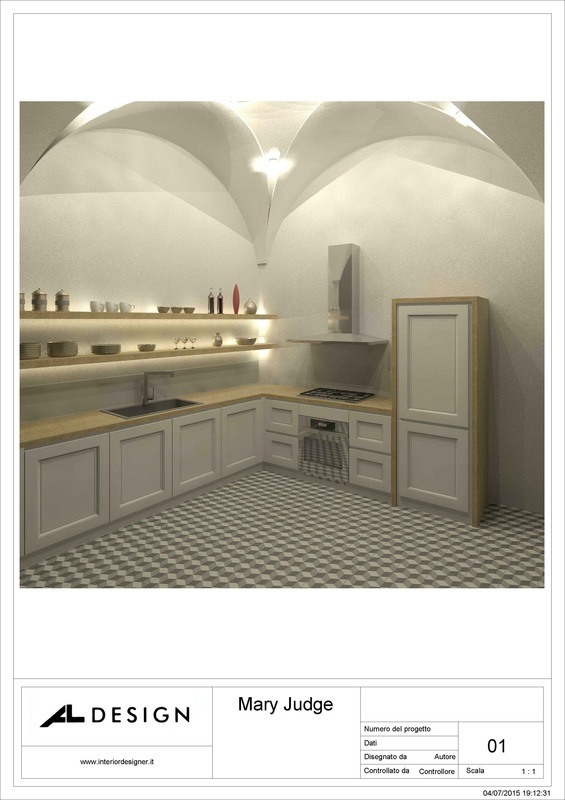 I choose a kitchen design with AL of Lecce and include the project drawings here. 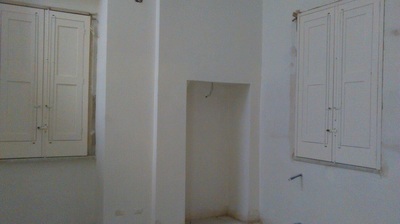 Thats the fireplace we have recovered on the left, it was in a former closet space. 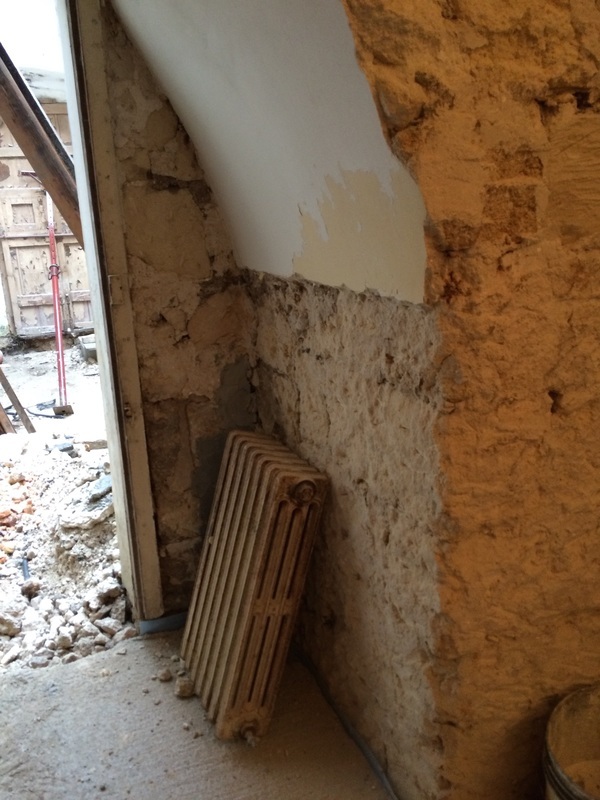 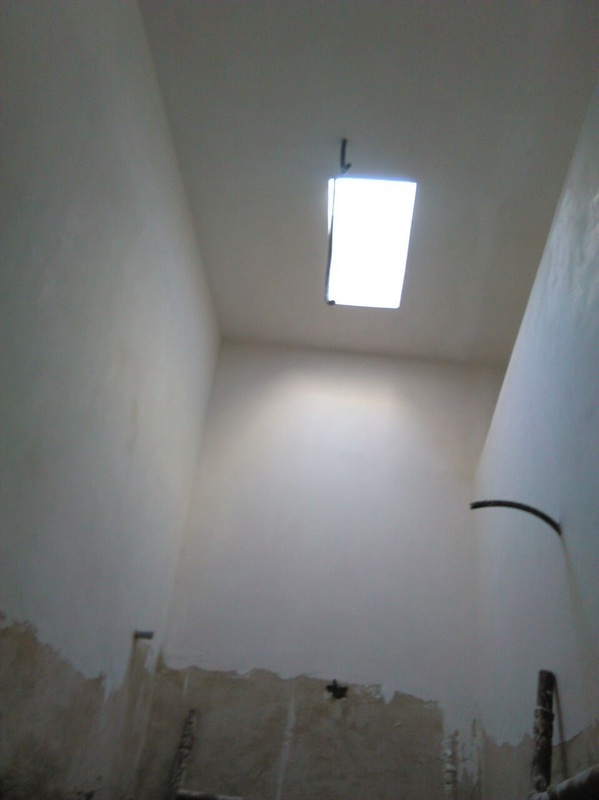 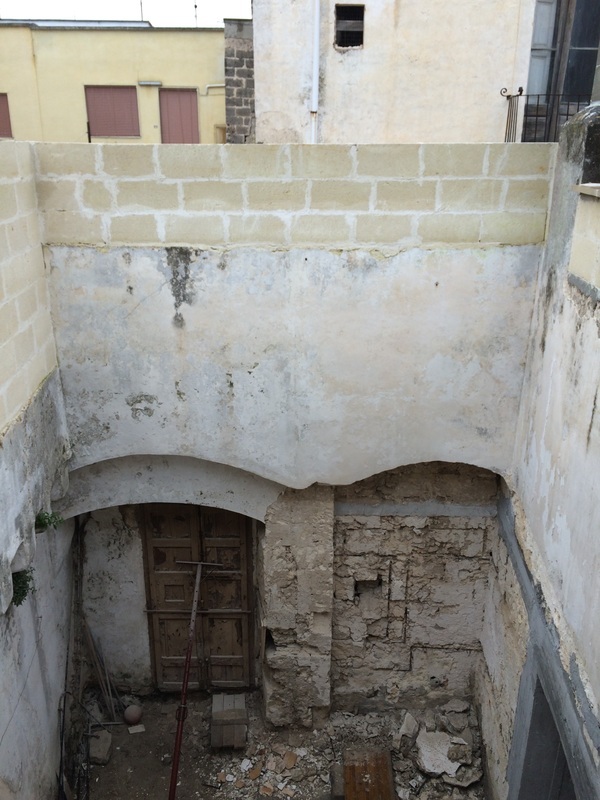 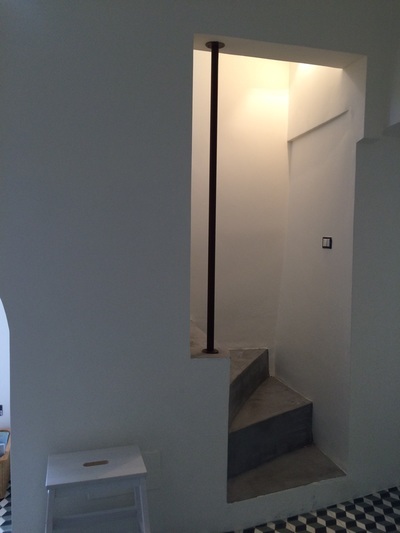 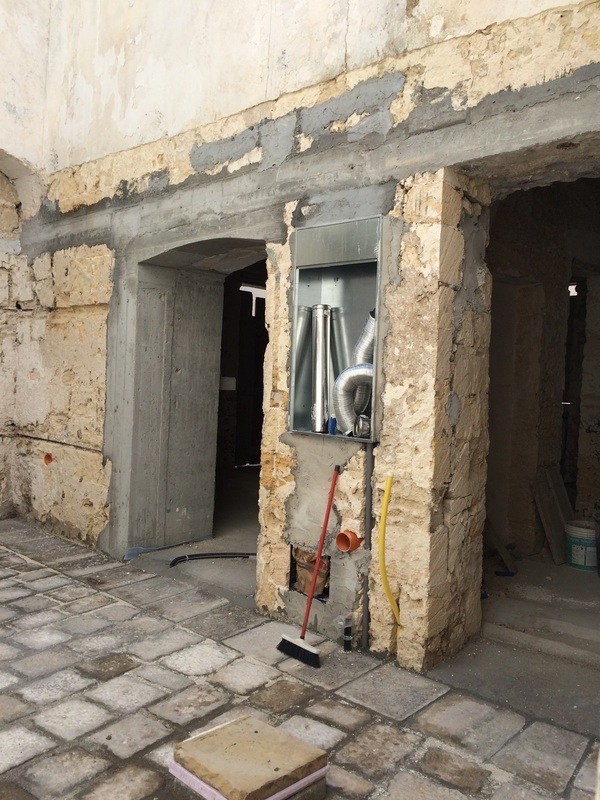 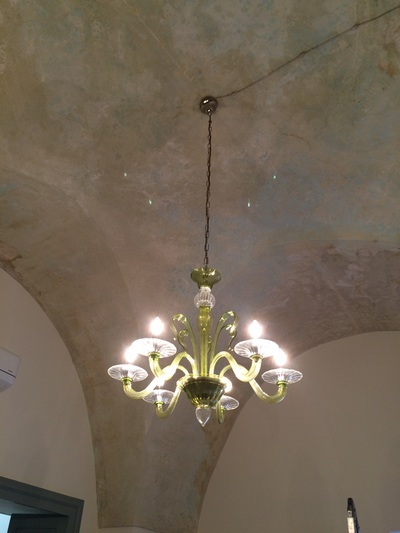 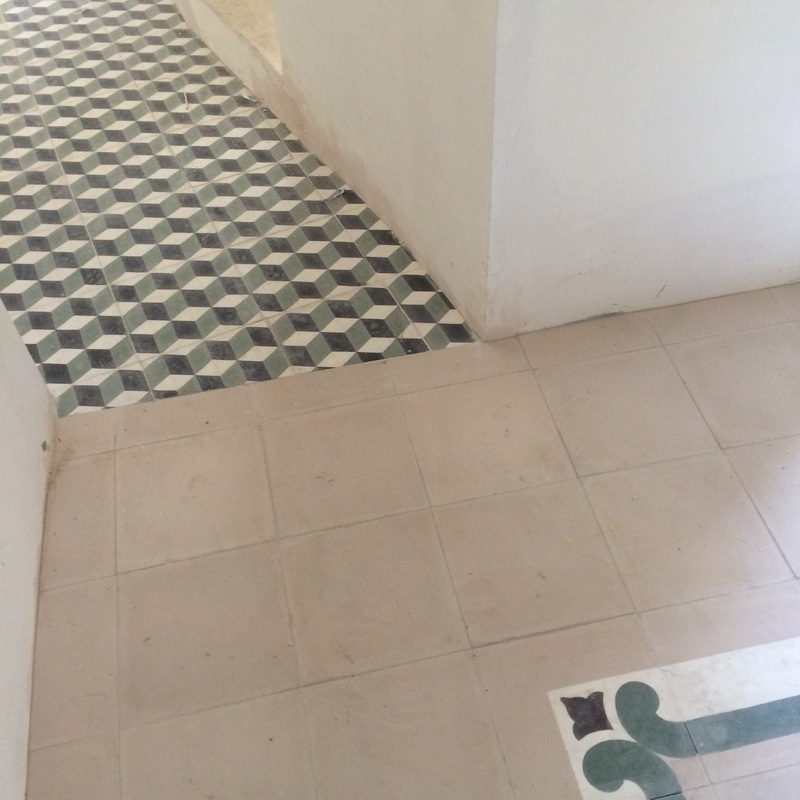 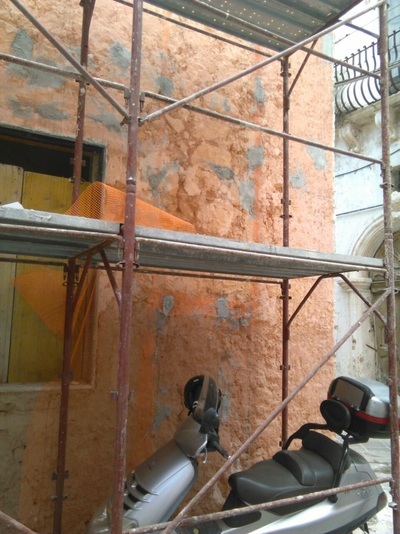 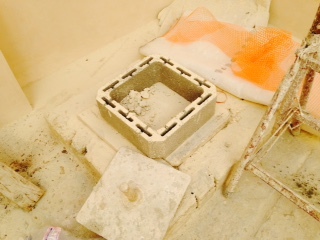 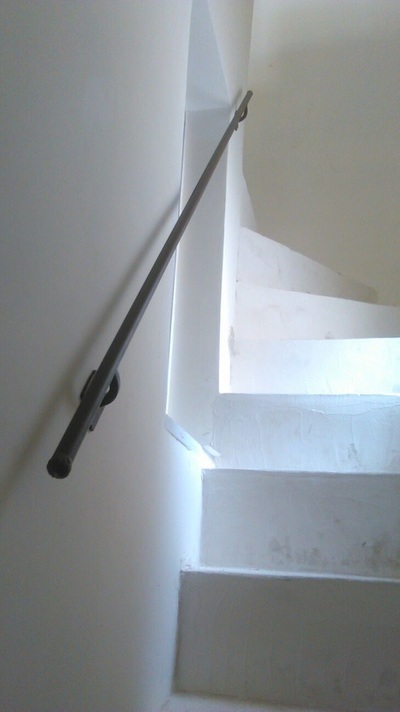 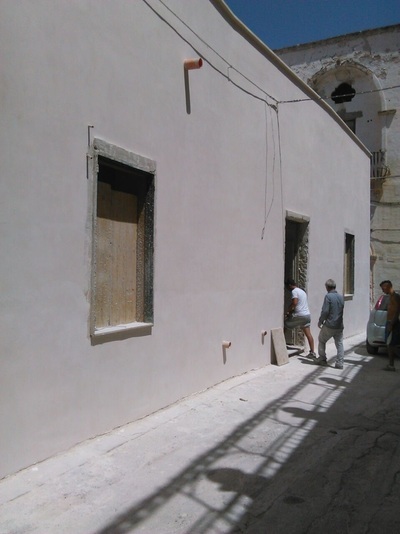 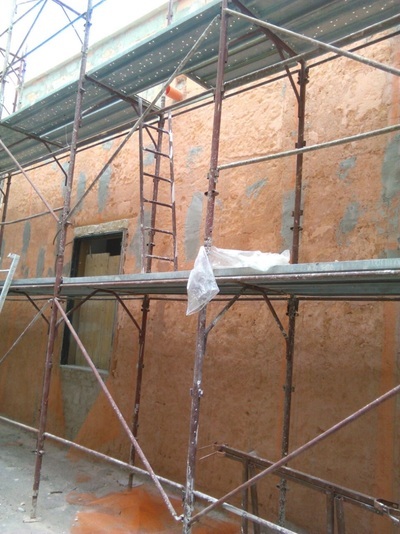 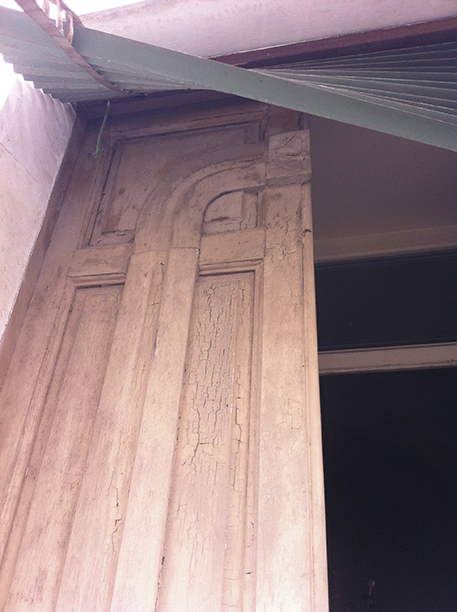 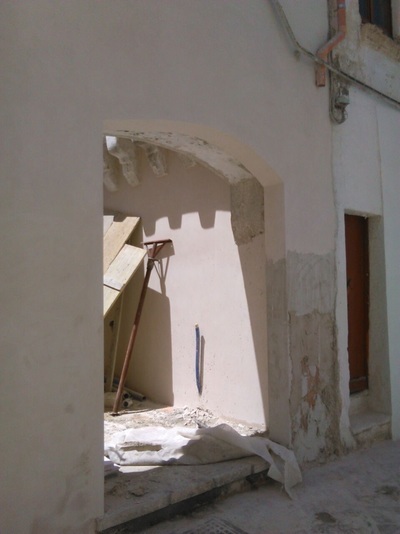 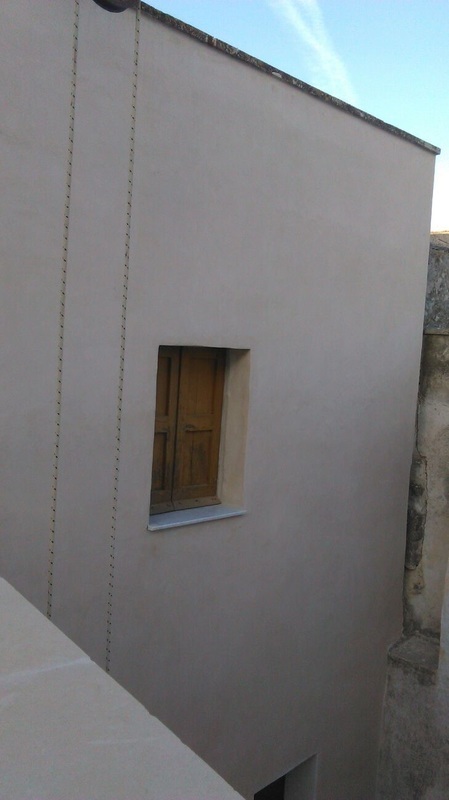 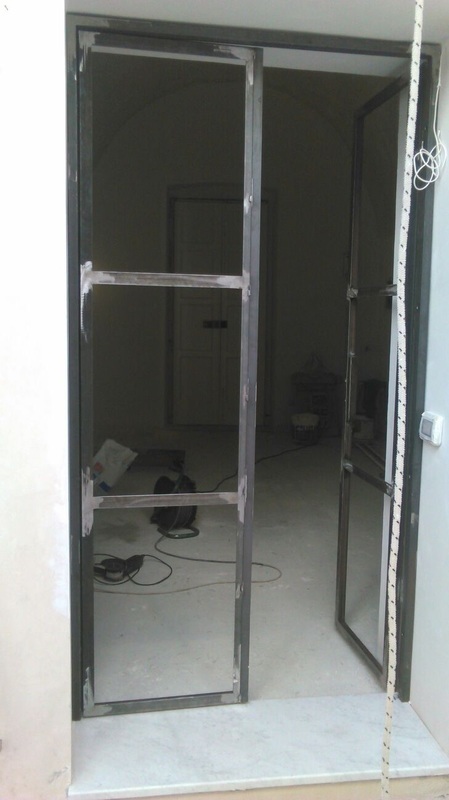 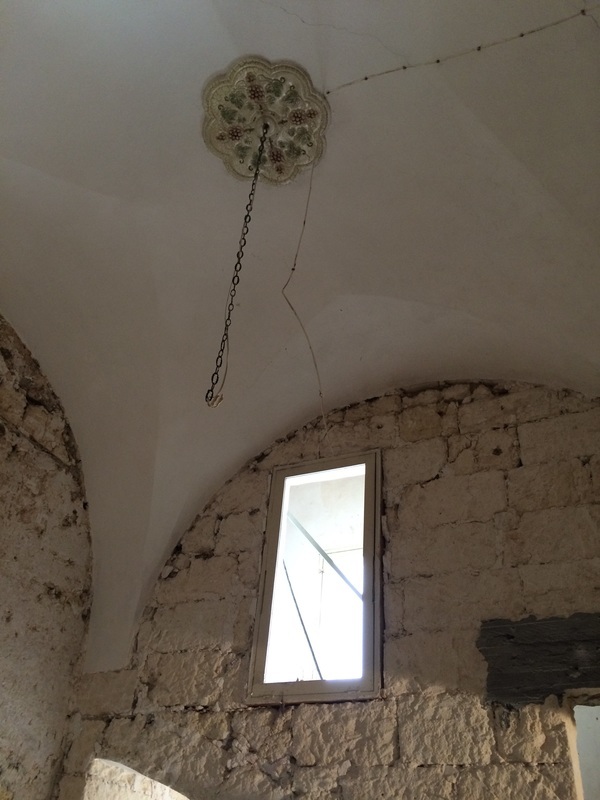 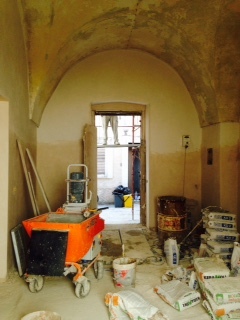 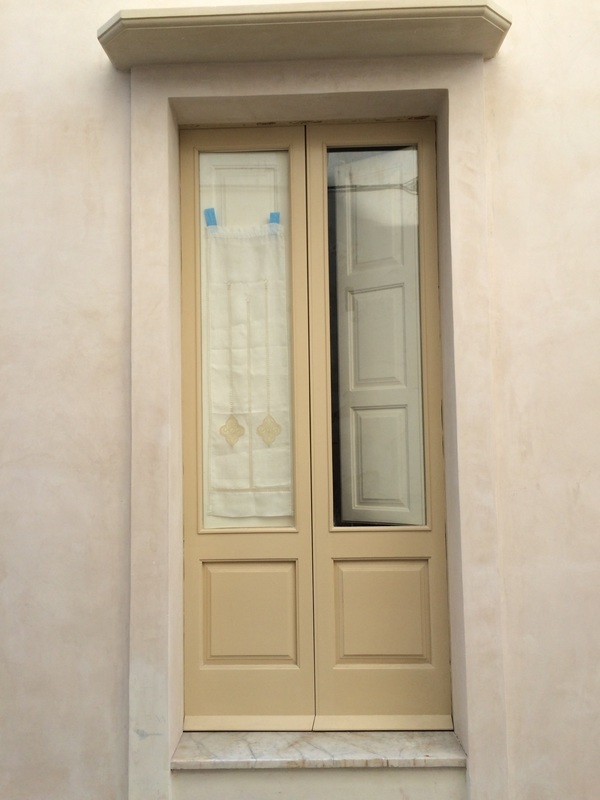 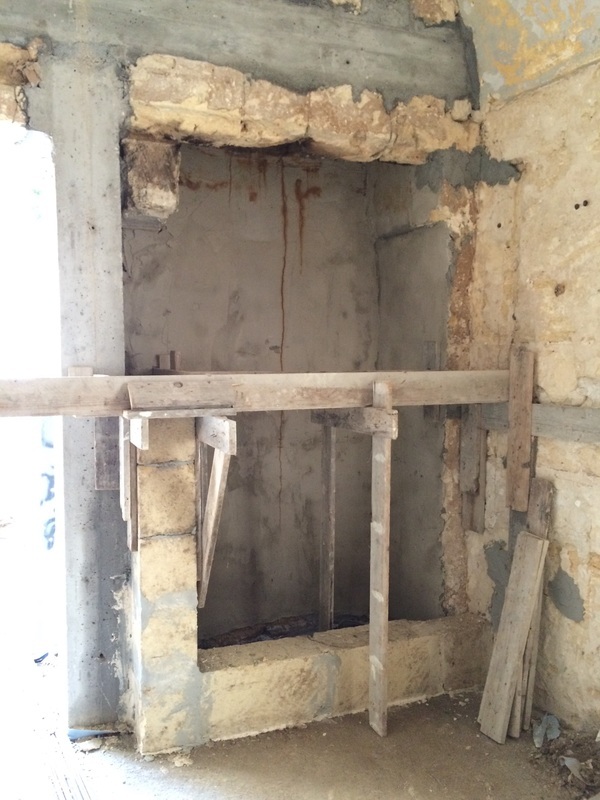 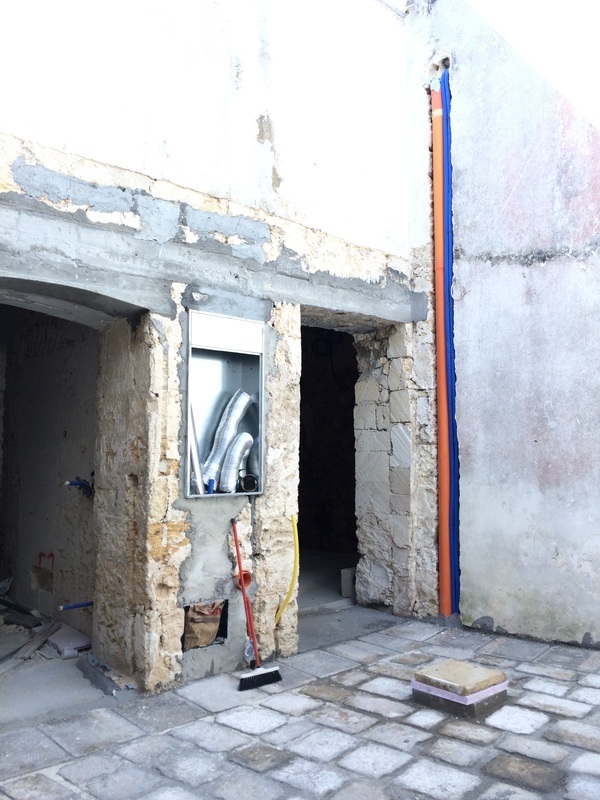 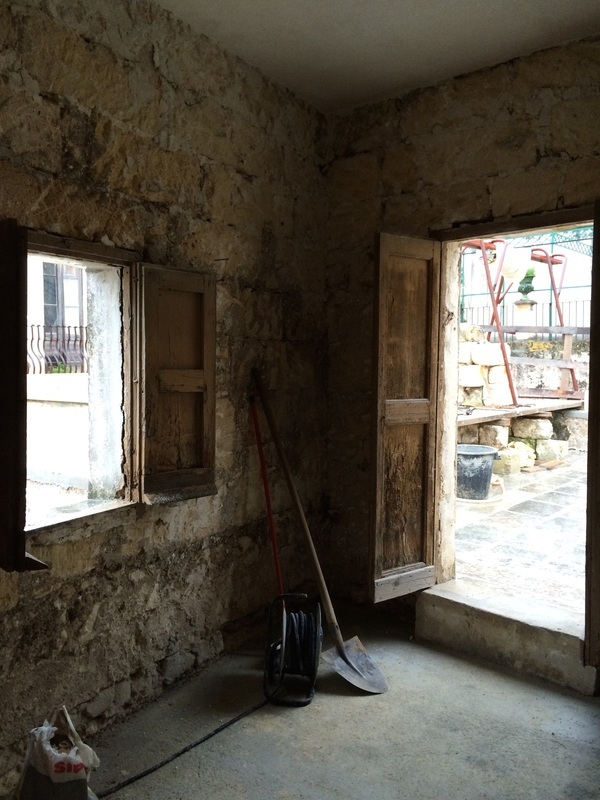 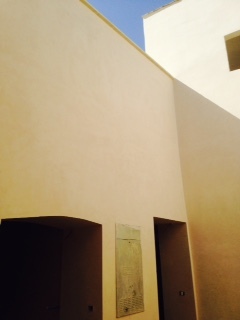 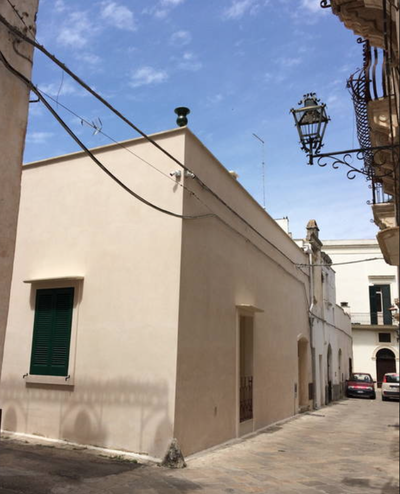 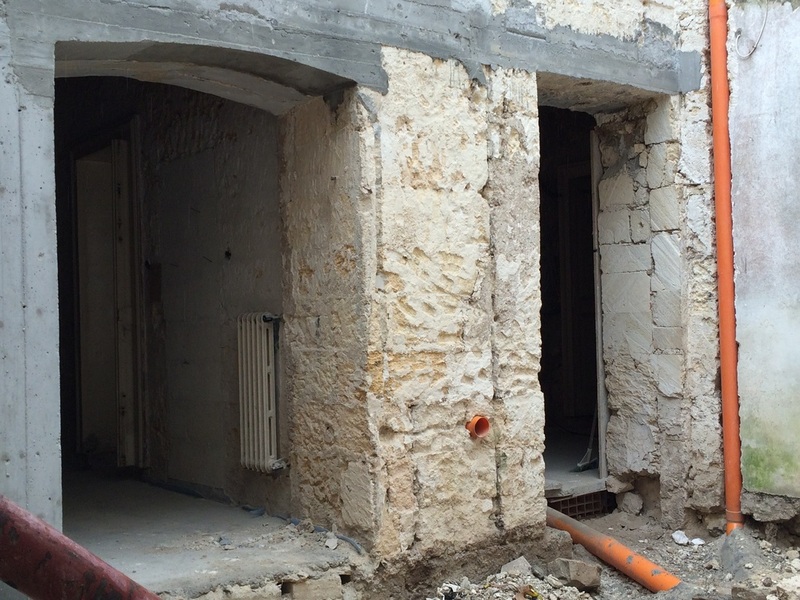 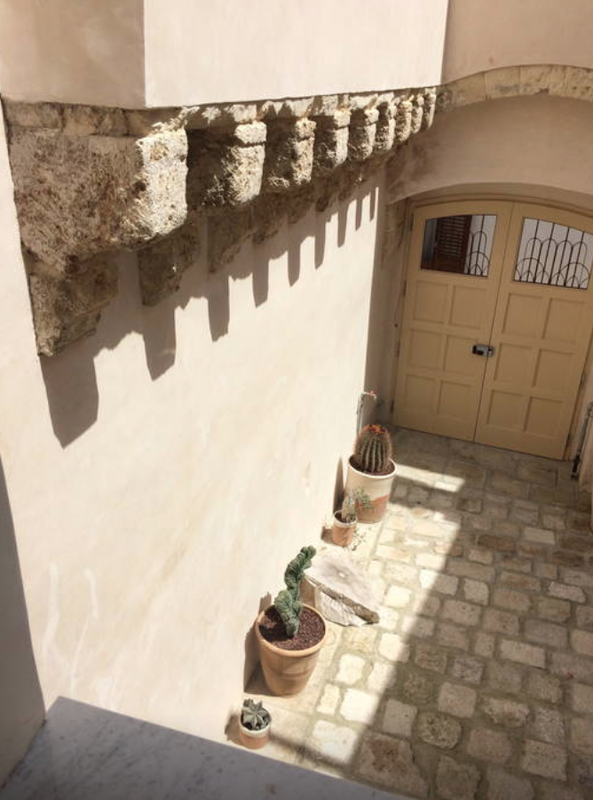 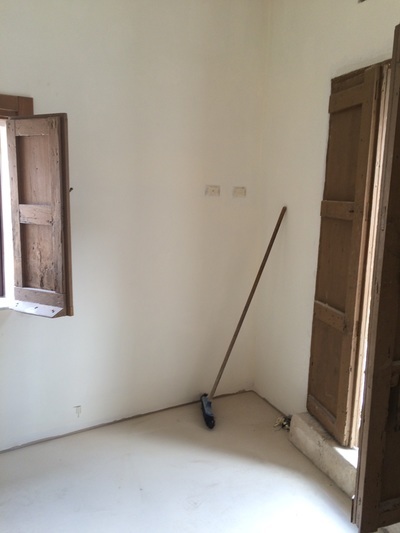 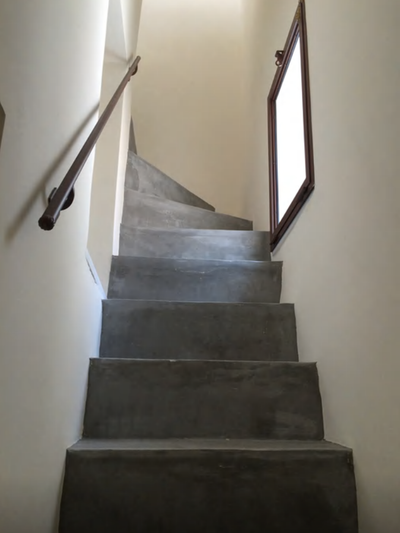 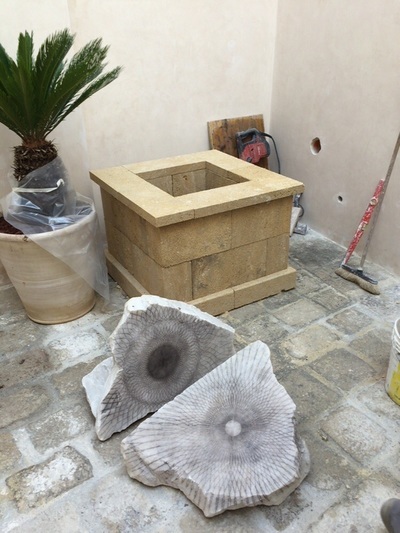 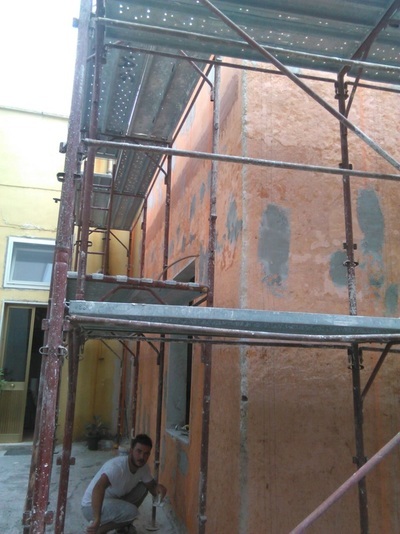 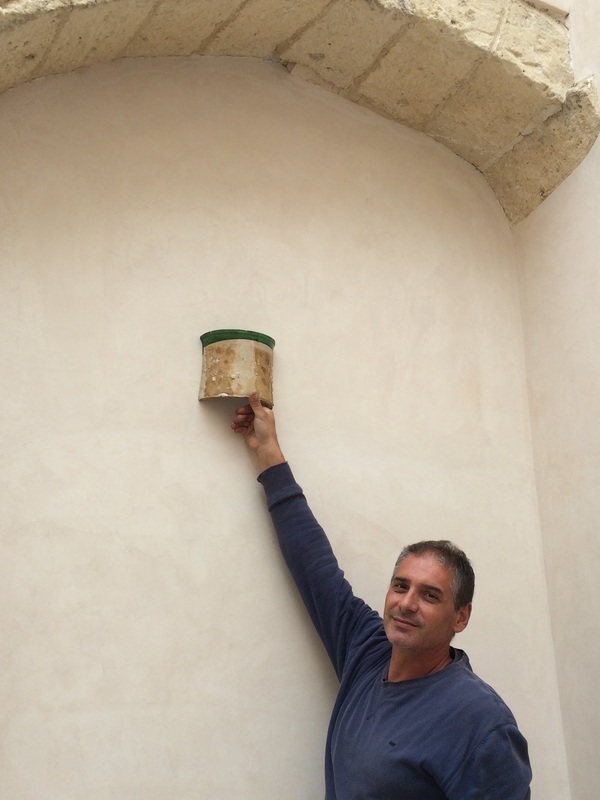 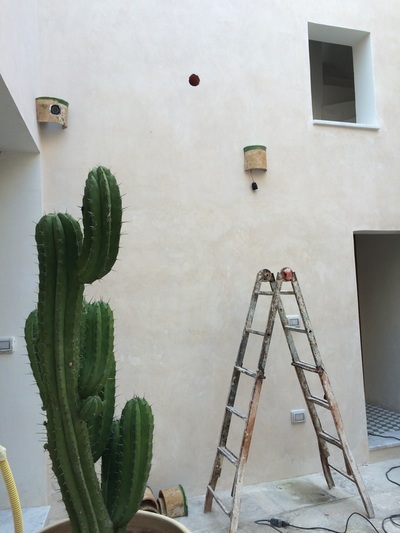 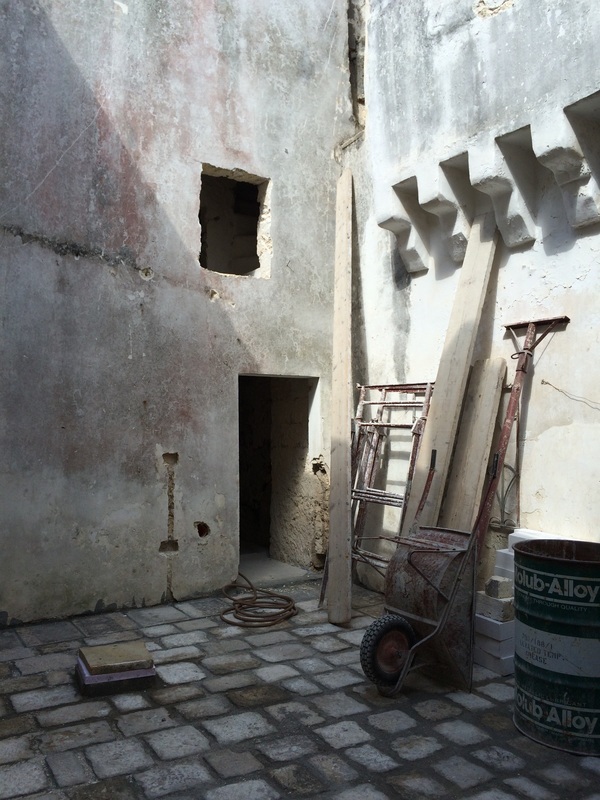 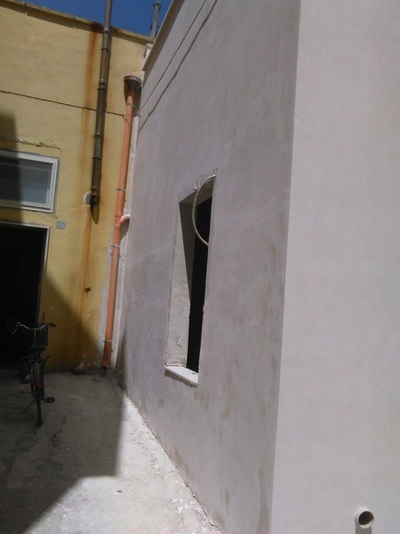 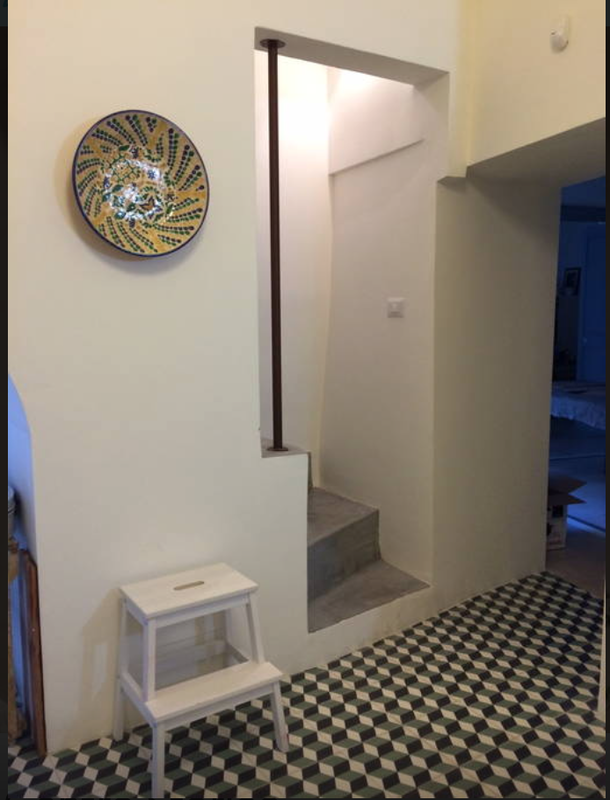 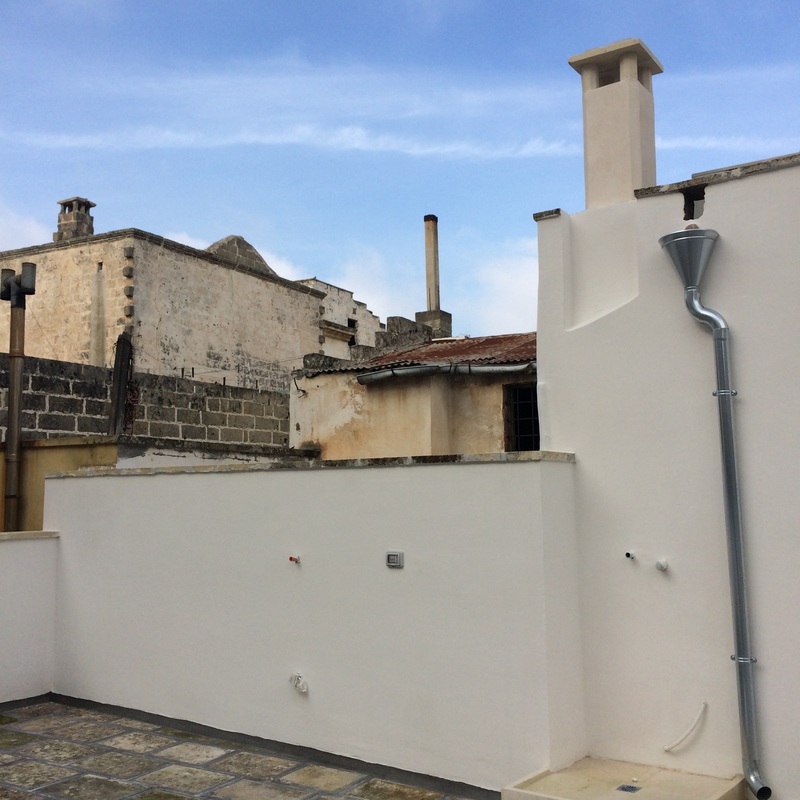 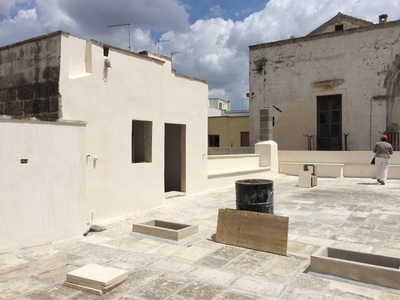 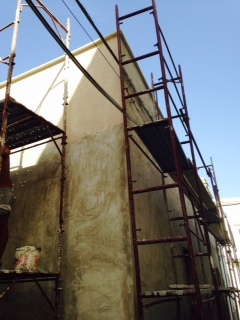 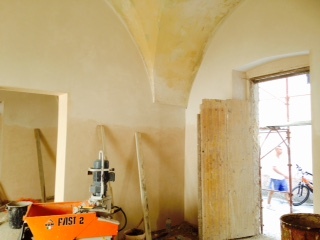 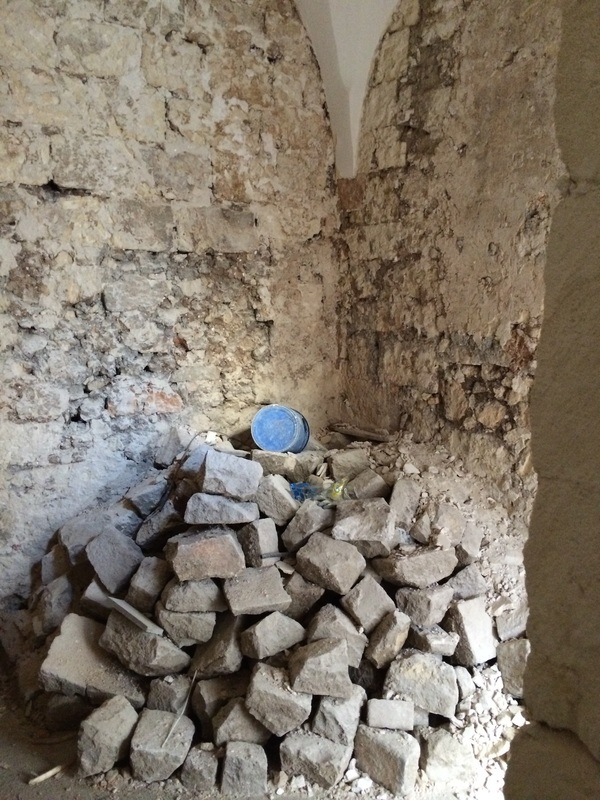 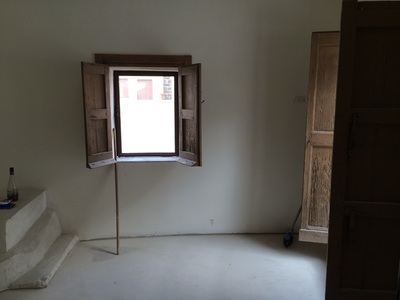 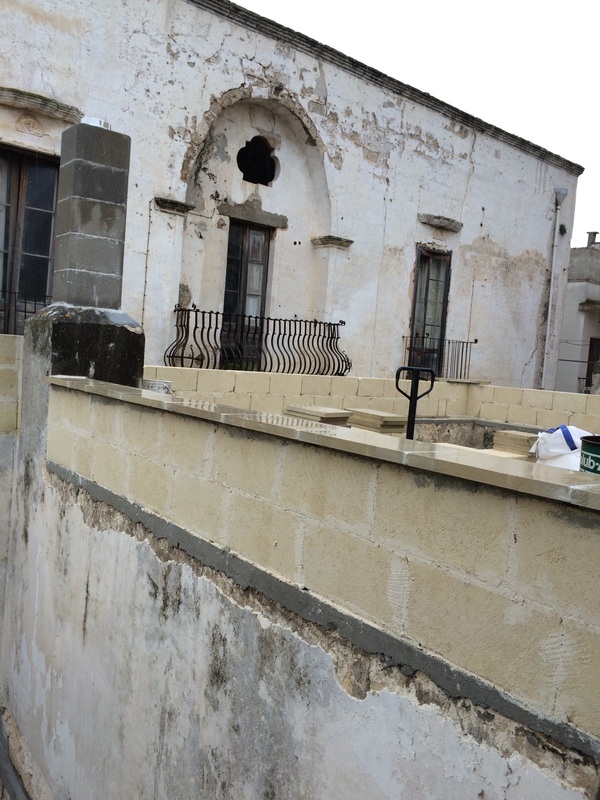 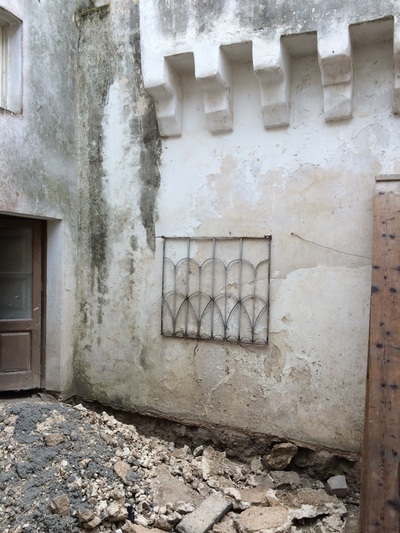 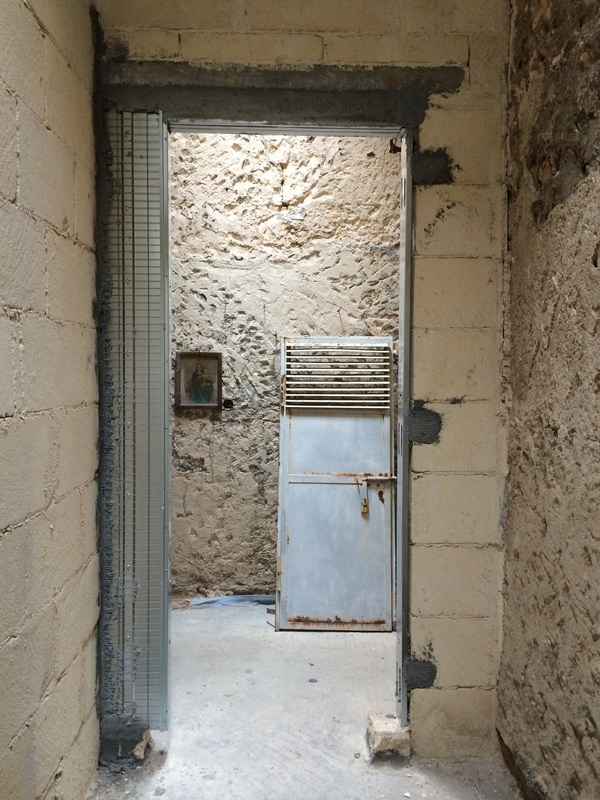 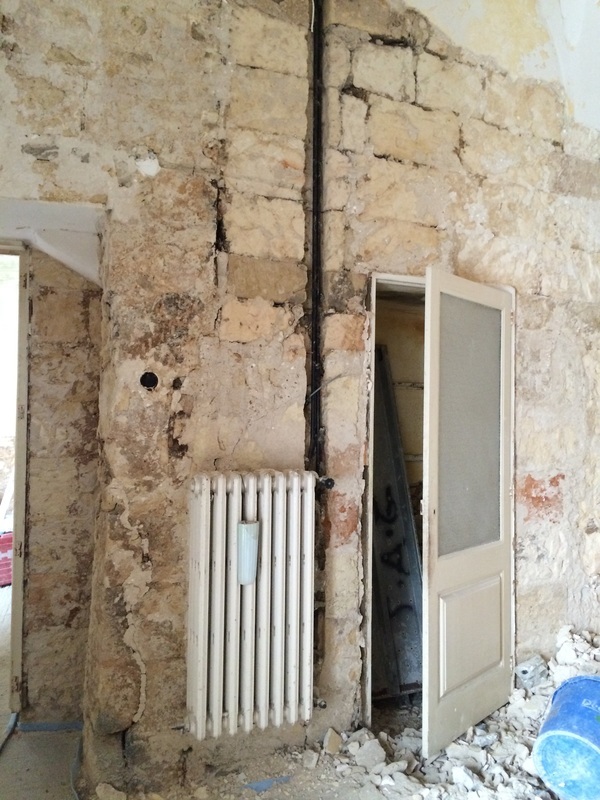 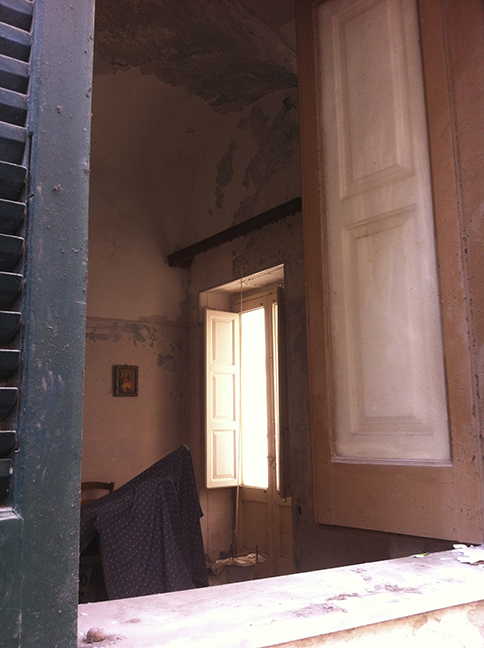 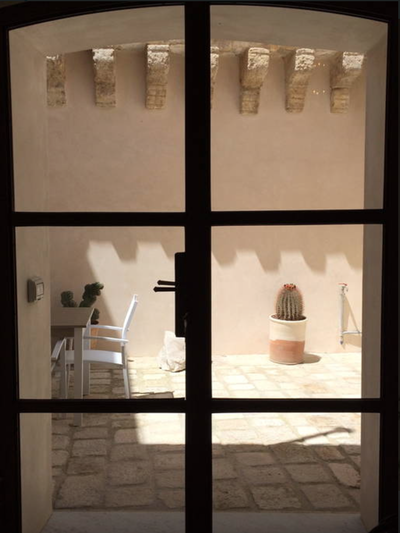 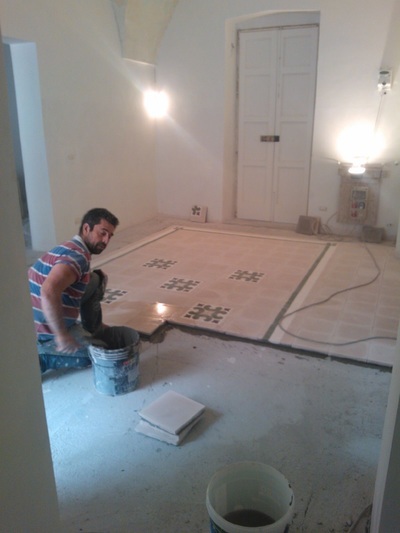 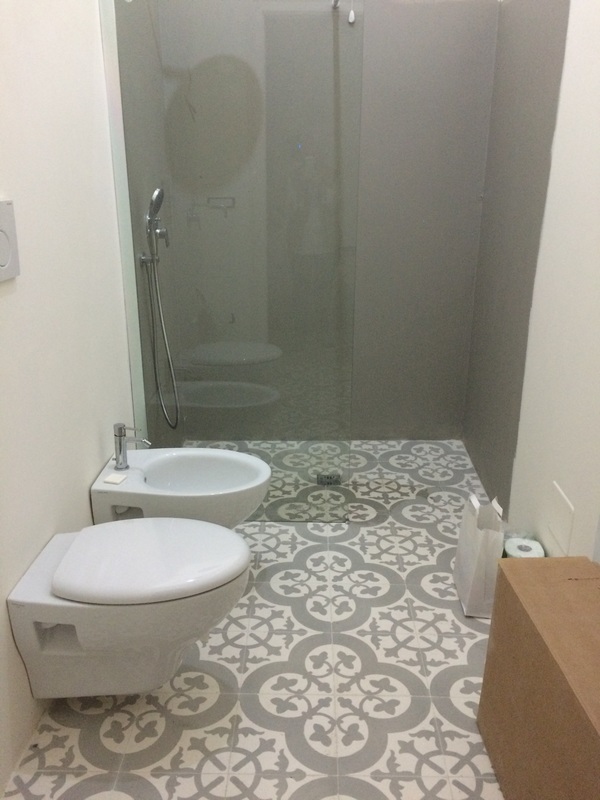 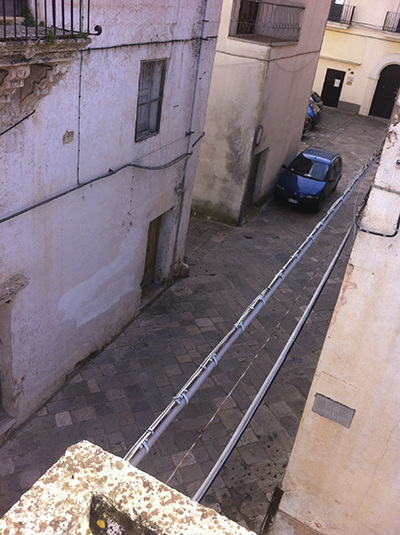 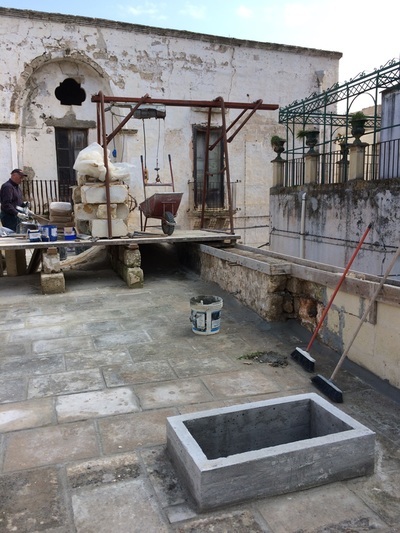 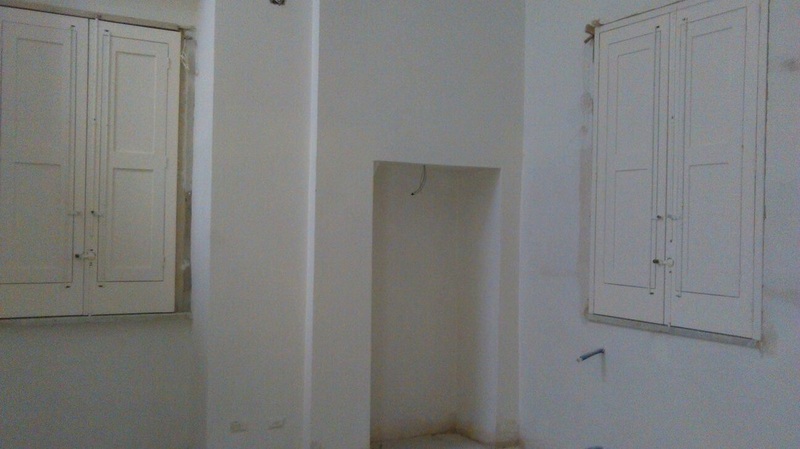 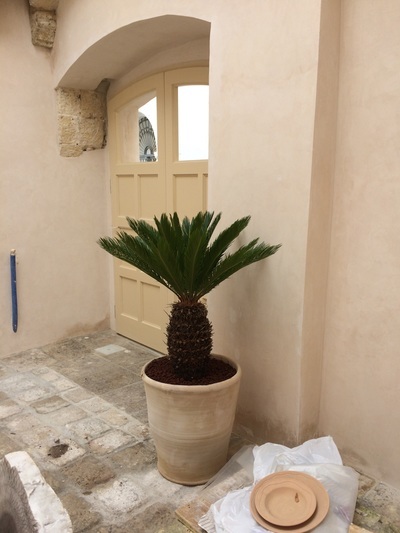 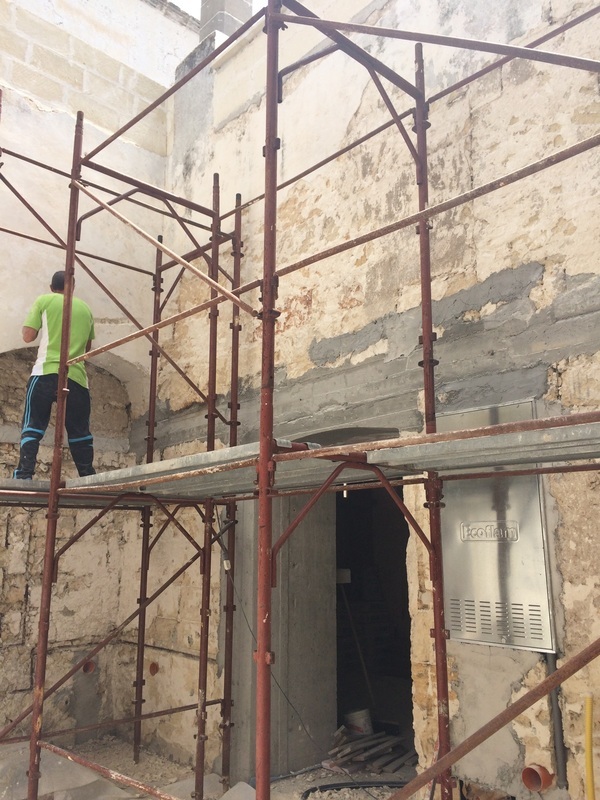 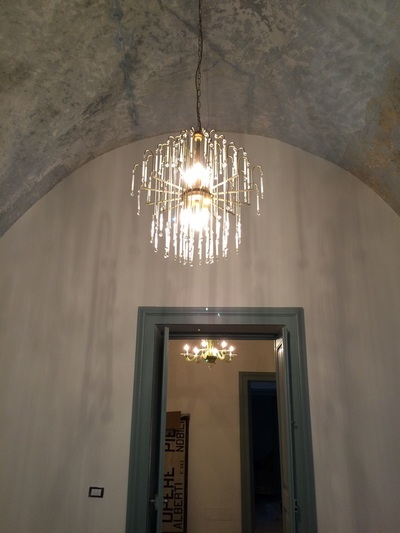 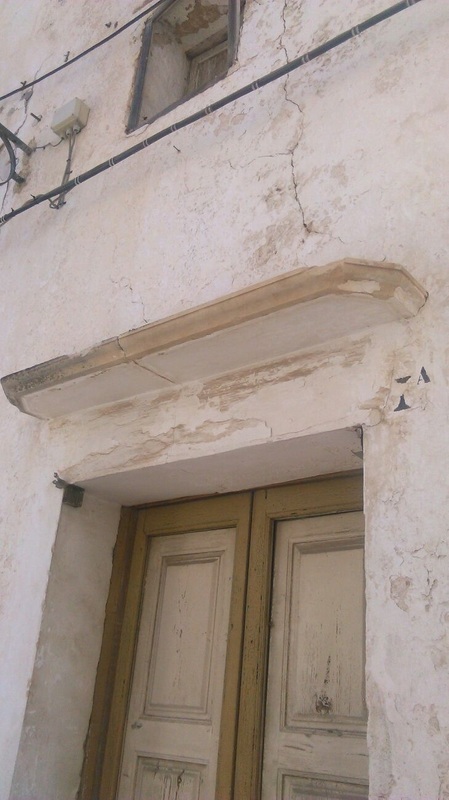 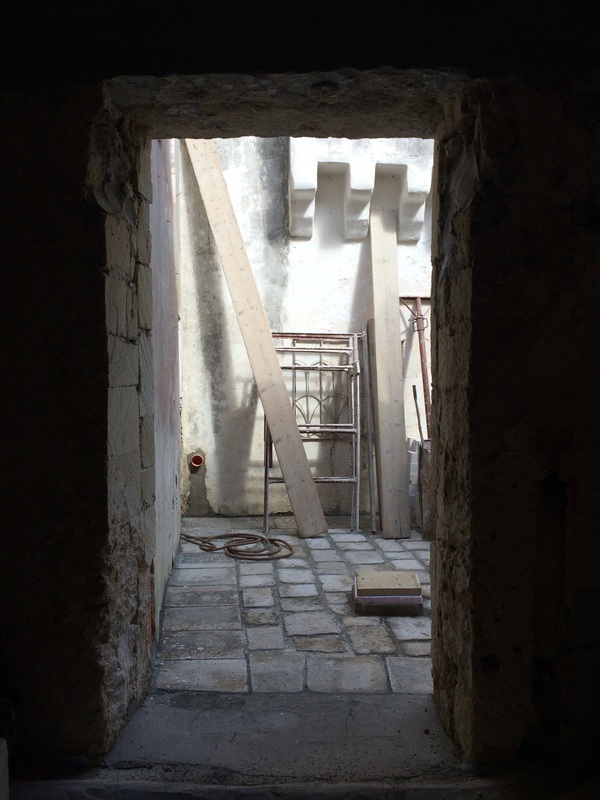 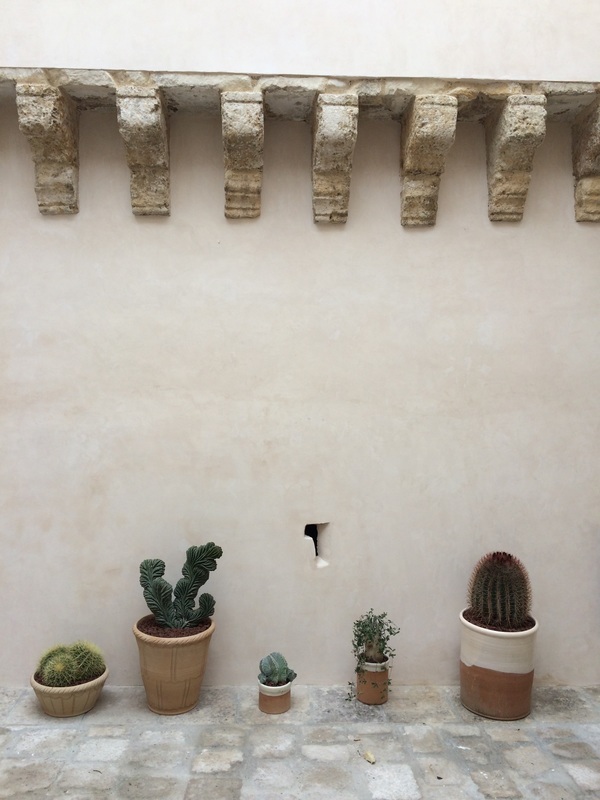 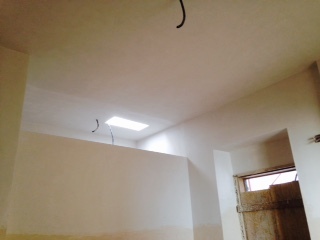 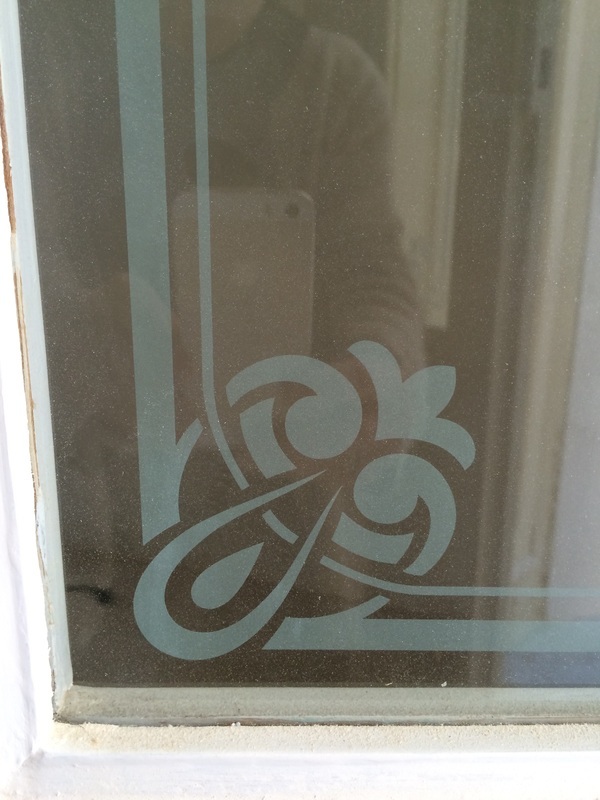 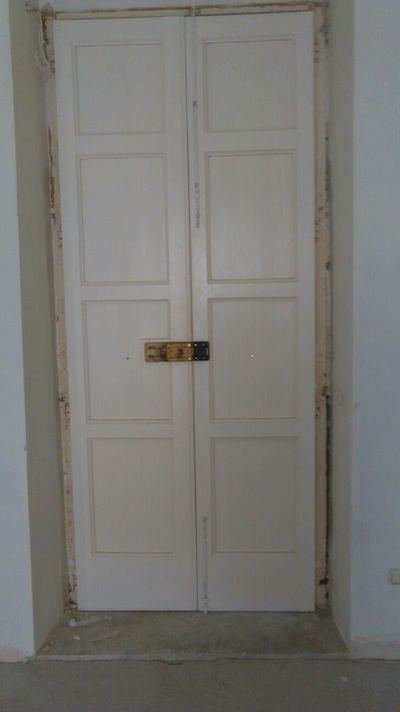 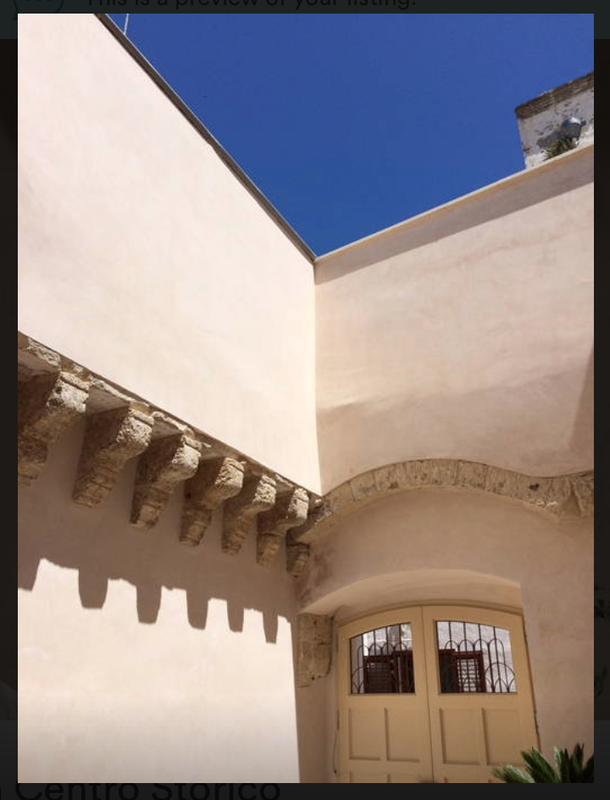 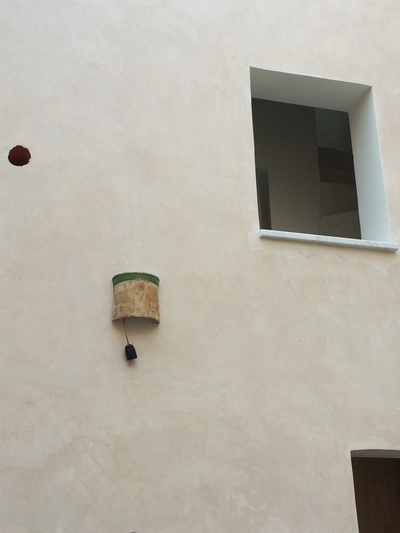 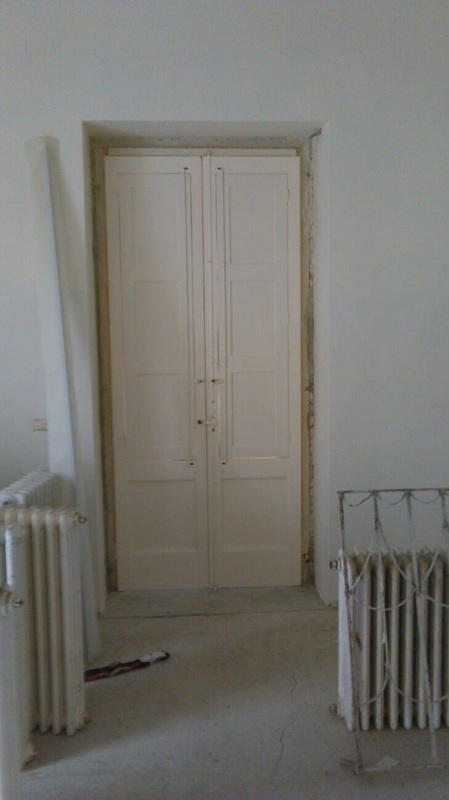 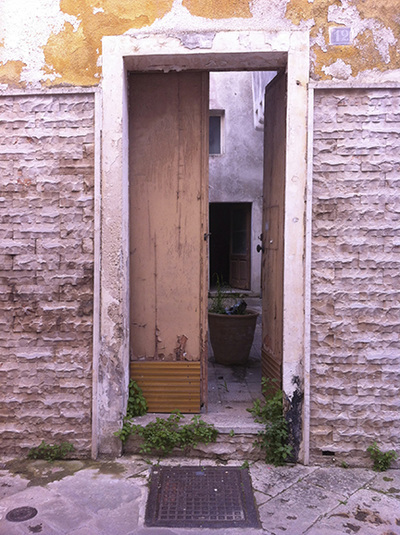 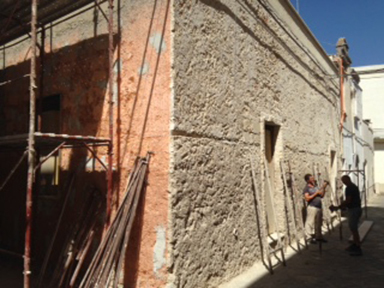 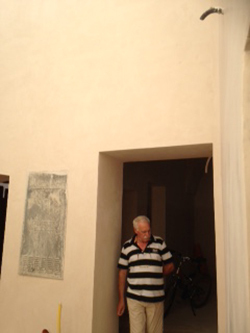 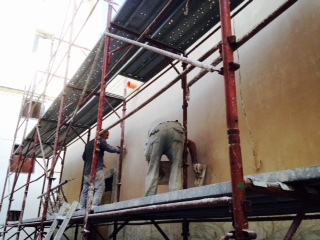 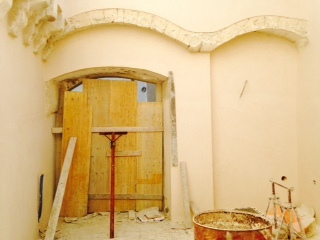 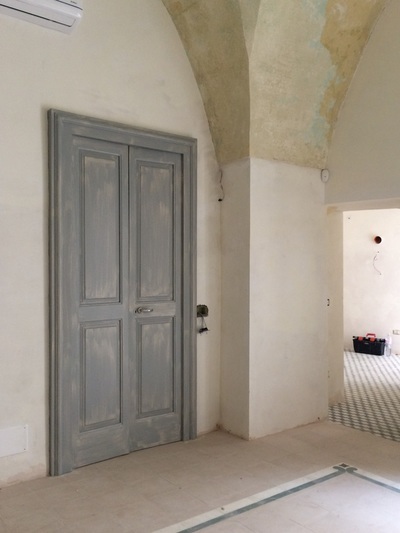 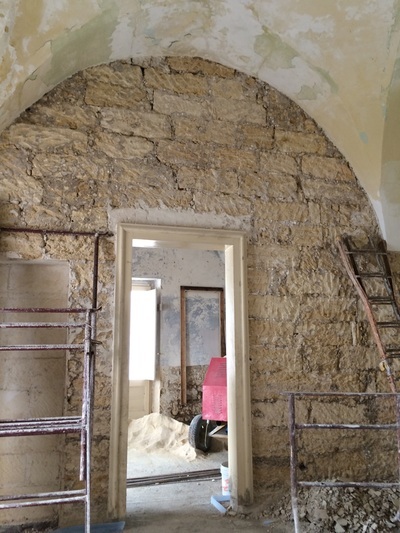 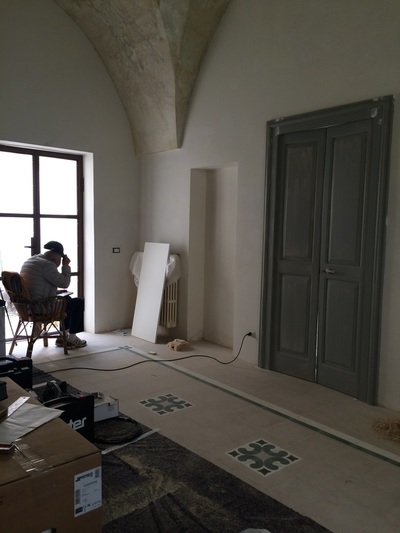 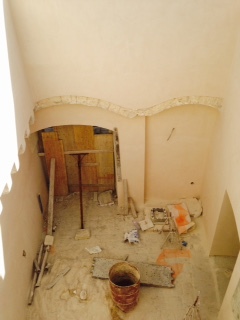 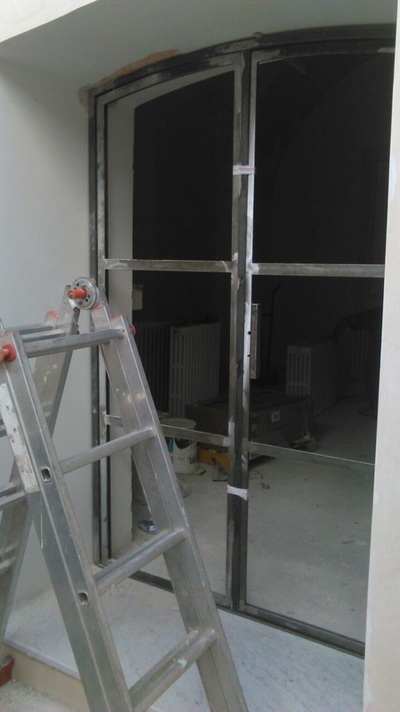 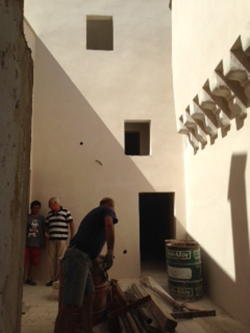 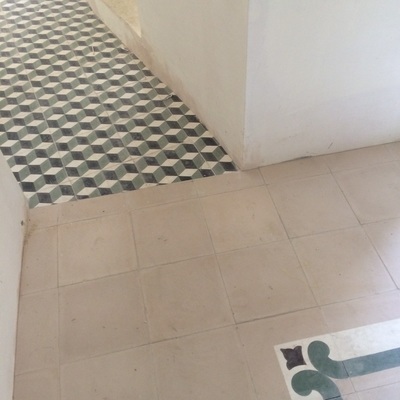 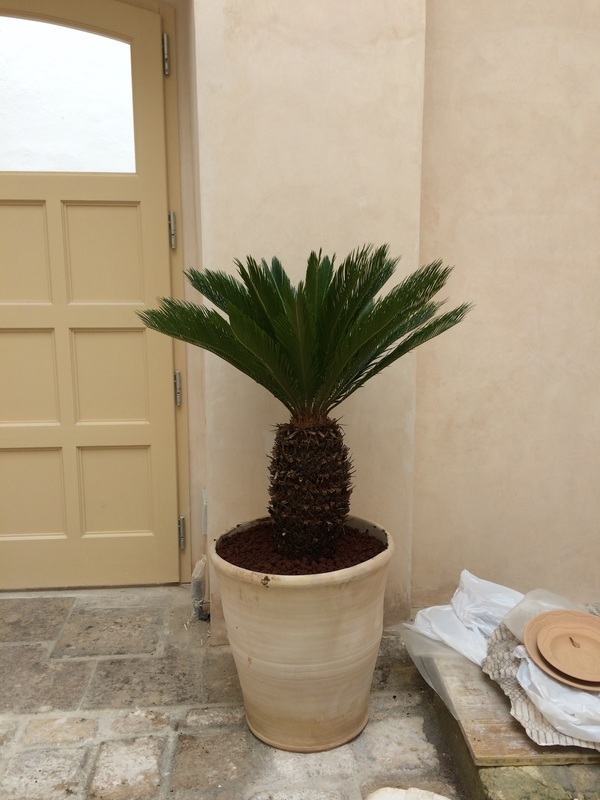 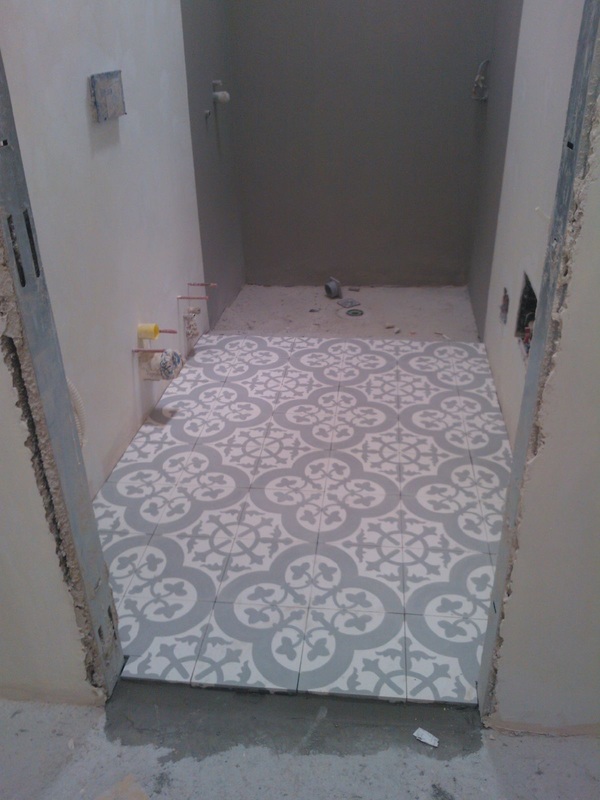 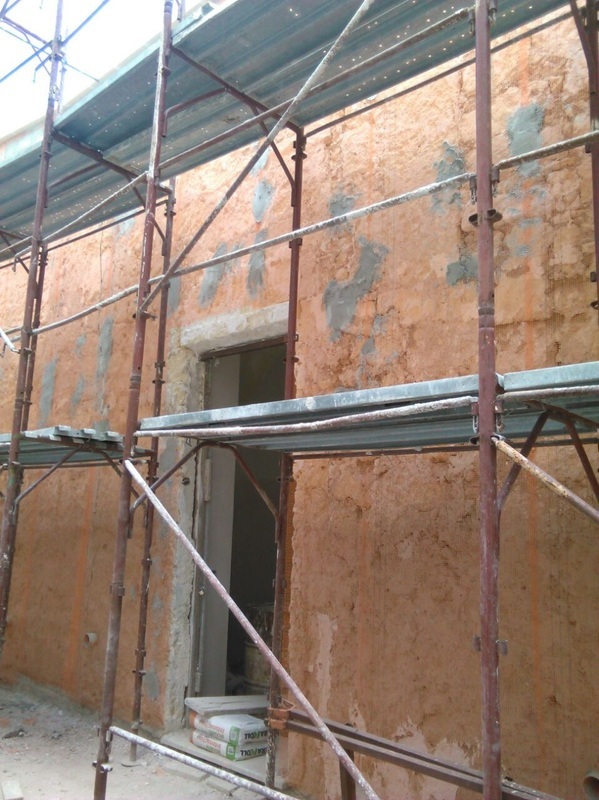 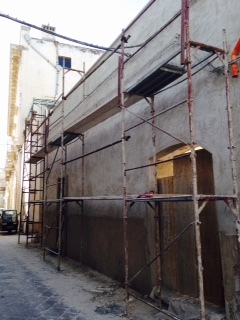 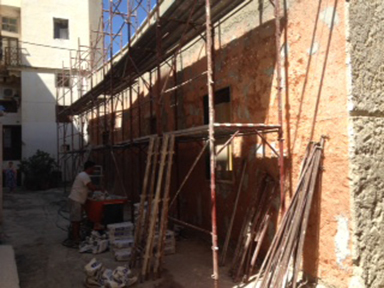 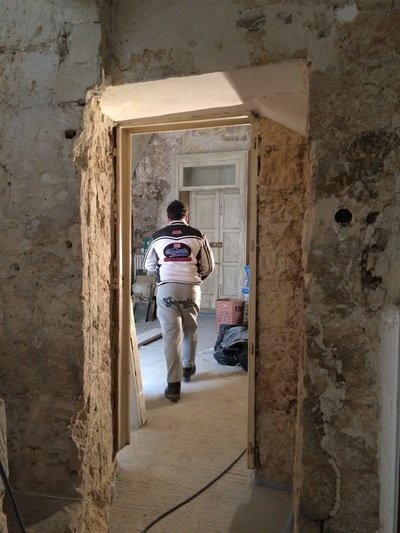 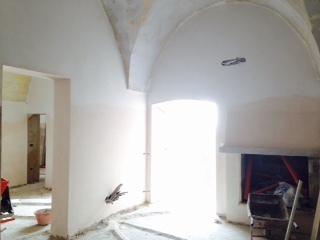 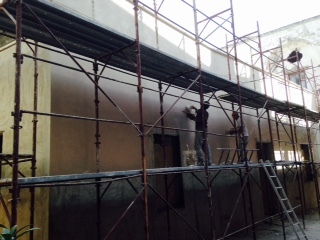 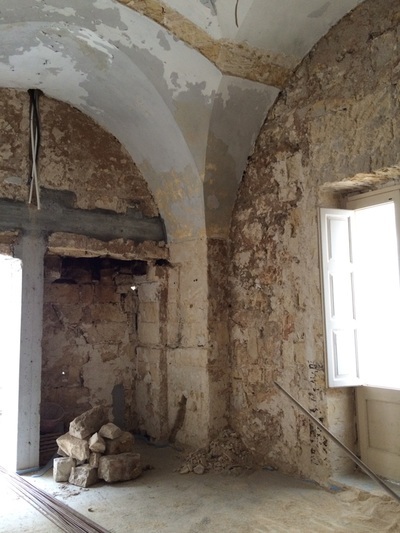 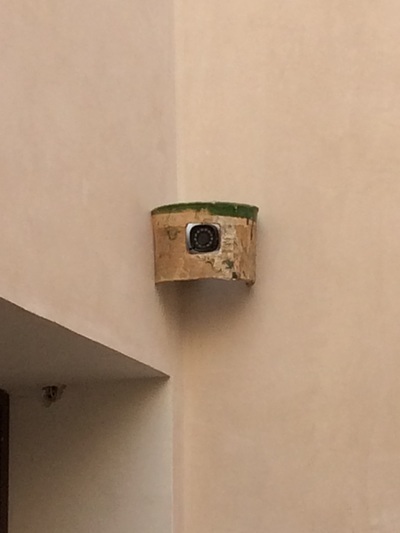 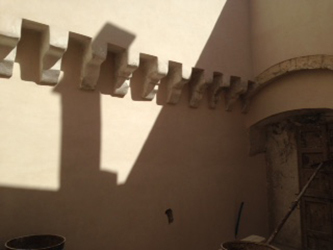 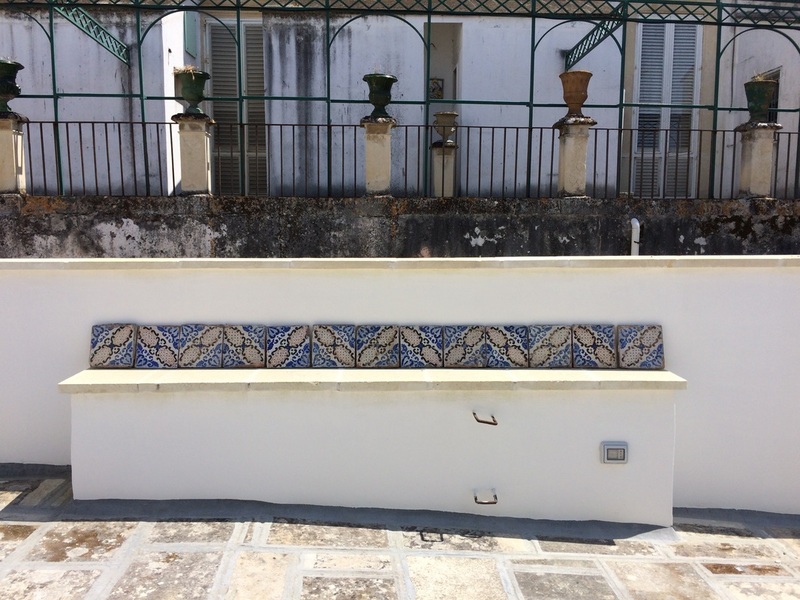 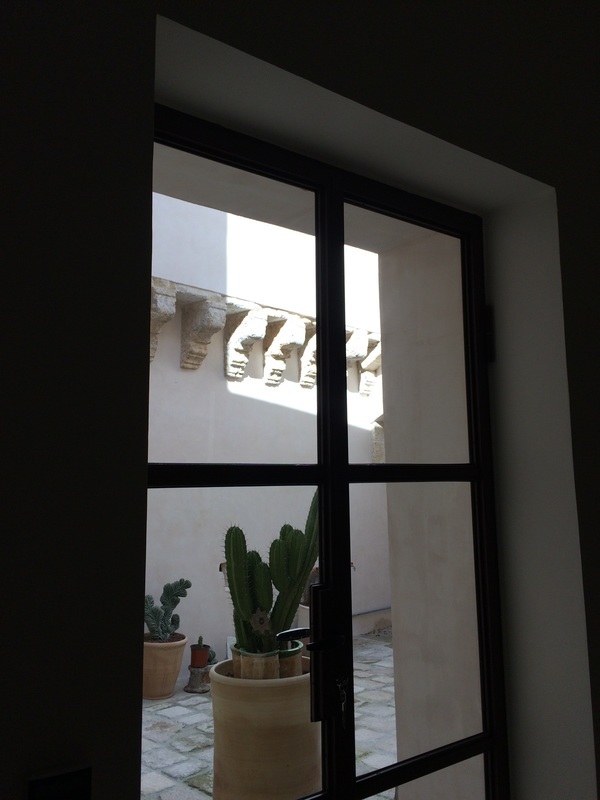 July 2015: finishing up the plaster in and outside! 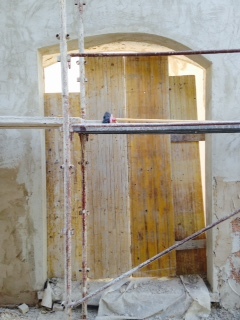 for August we close down and have a good vacation, then in September into the final stretch. 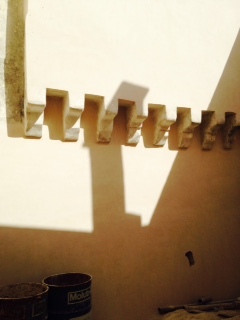 Last days of July! 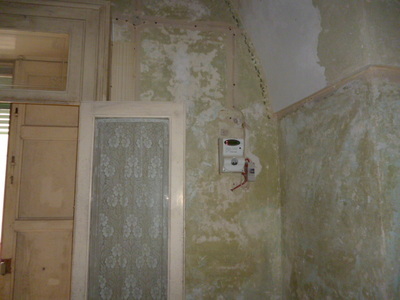 Wow what changes we have made! 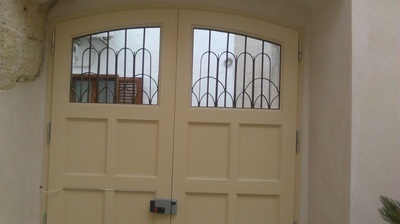 when I see the "as is" photos I am astonished! Last plaster before August vacation! Cactus! 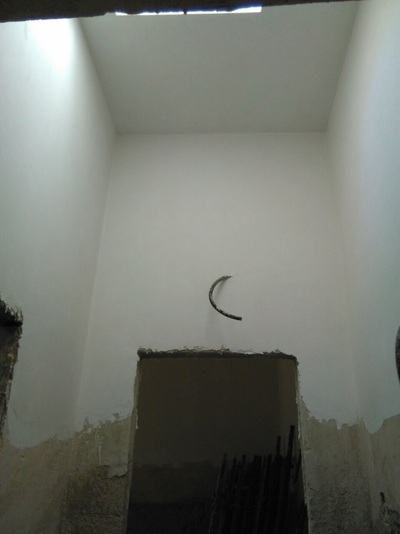 could not wait. 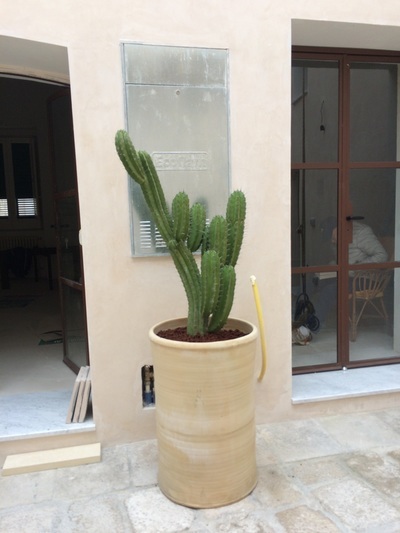 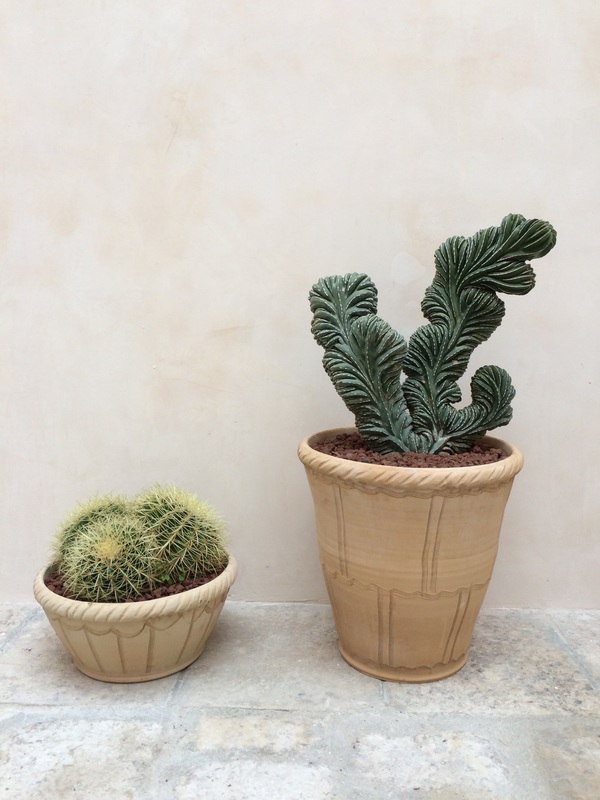 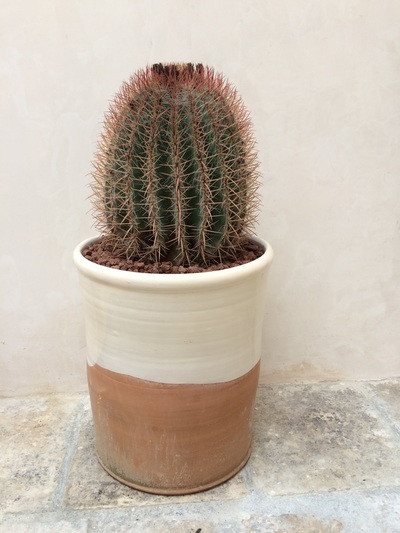 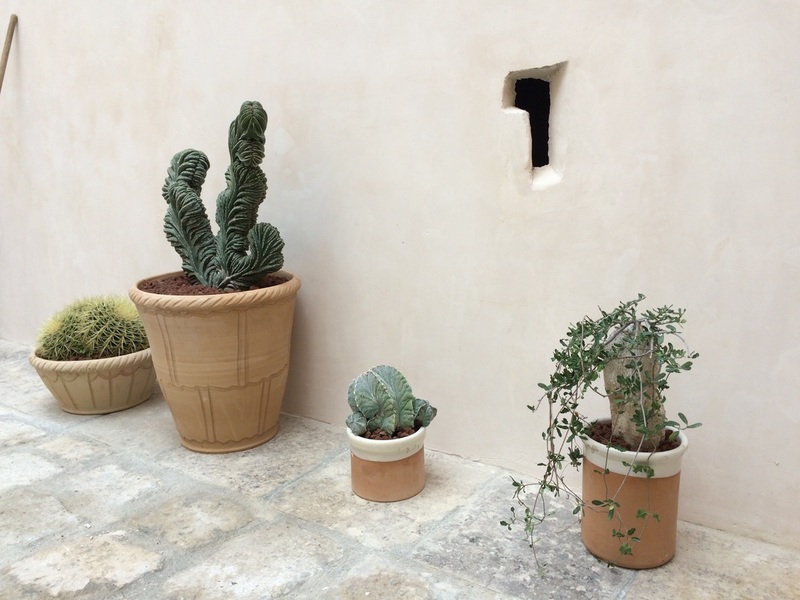 These plantings thanks to Antonio Scarascia, of Scarasciacactus, Monesano Salentino! 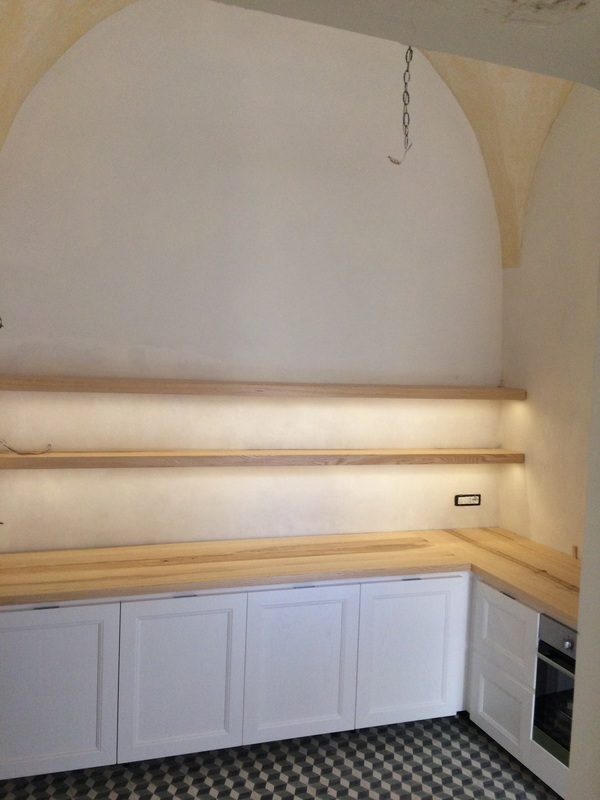 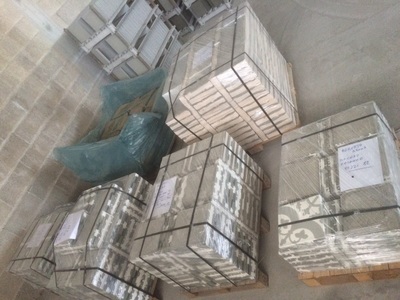 Interior finishes: seem to be difficult to make the proper decision on these, but I think we have chosen well. 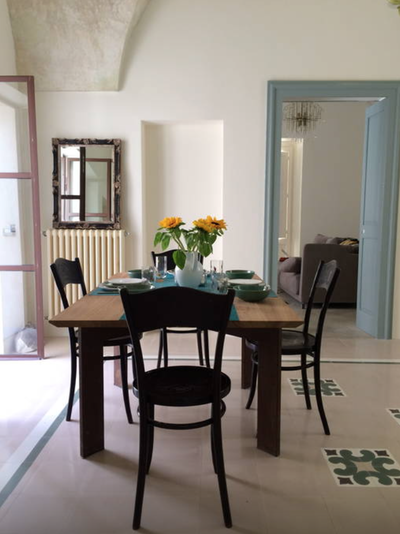 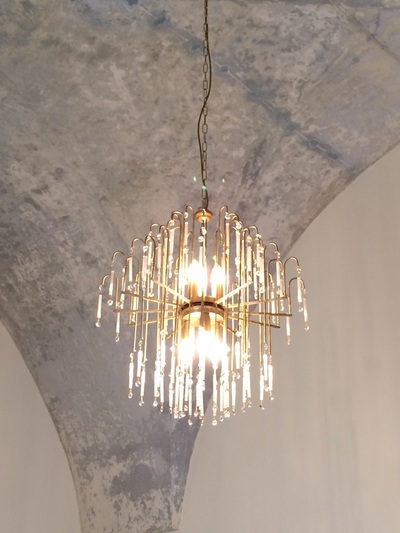 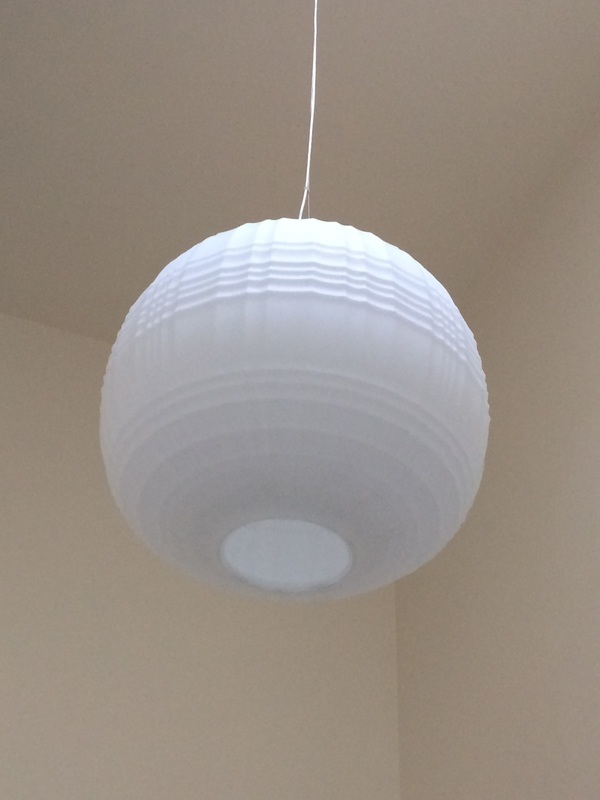 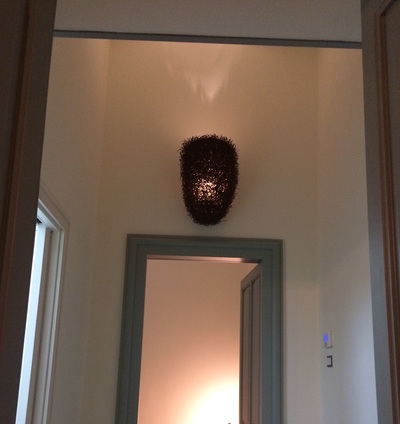 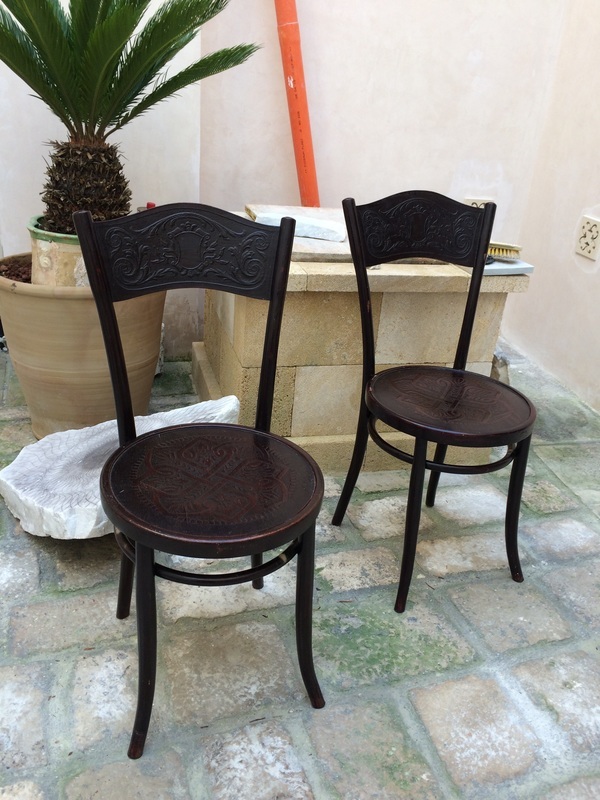 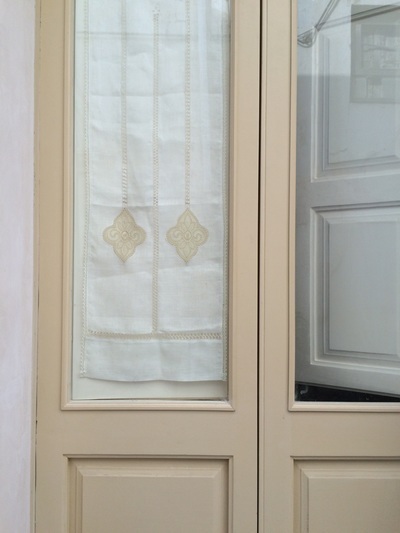 ​February 2016: fun with furnishing! 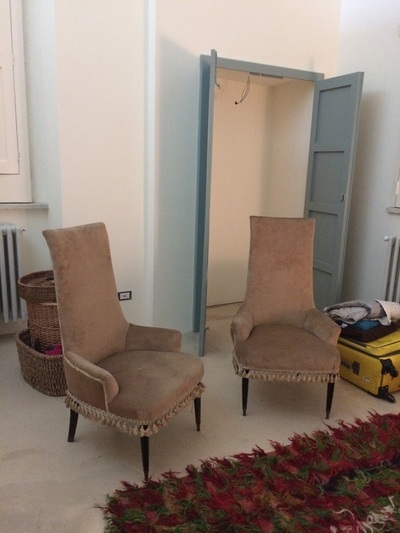 unpacking personal items from my place in Umbria and spreading out.